Over an eight-day tour, I was completely immersed in UK culture, cocktails and cuisine. I tasted a Scotch Egg, explored Kent’s incomparable vineyards, and got to see the gin craze firsthand. I’d say it was a week-long lesson on imbibing like the British. This trip was in partnership with Great British Food and their “Food is GREAT” campaign. If you’re planning a trip to the UK soon, make sure to follow @GreatBritishFood for the best food, drink and other travel recommendations. I was truly honored to experience the unbelievable range of food and drink available in the UK. 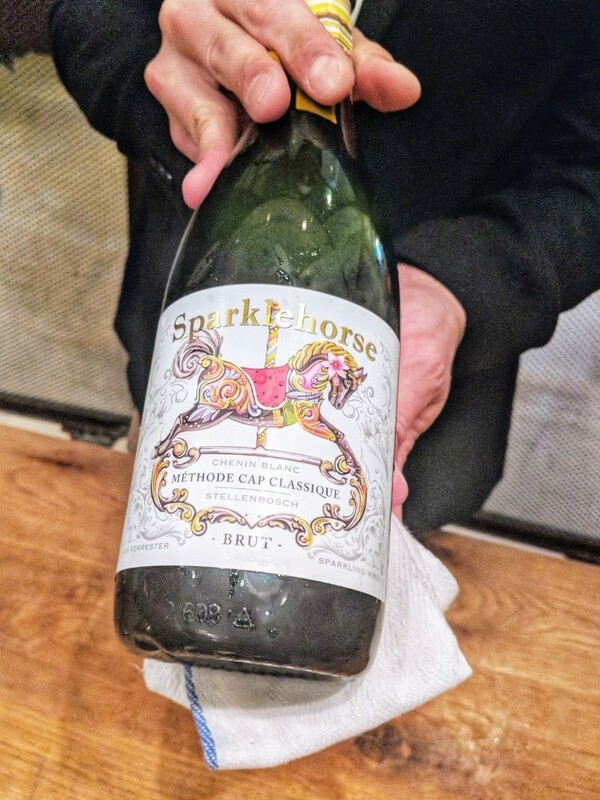 Having tasted and worked with a few English sparkling wines over the years, I’ve always been impressed by the heightened acidity and Champagne-like minerality. This is due to the fact that most English sparkling is produced in the same style, and even planted in a similar climate to, Champagne. 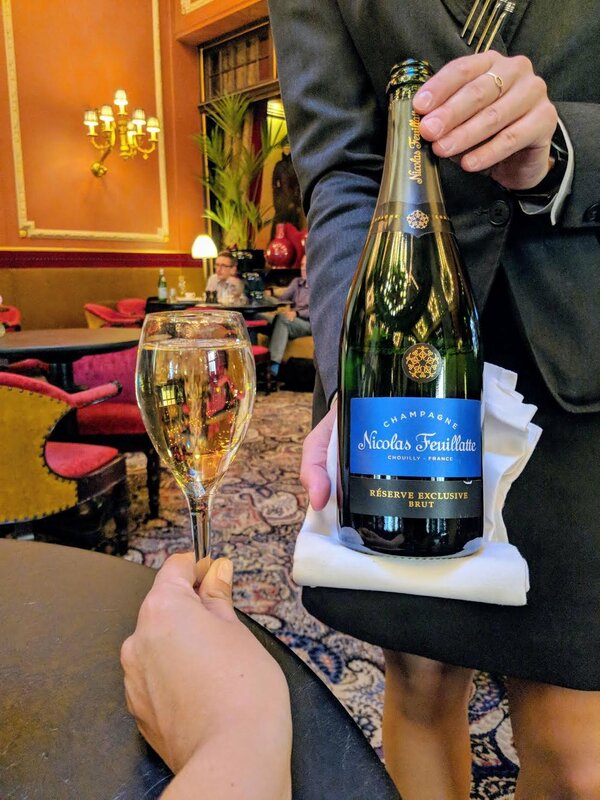 At around half the price, putting this bubbly on your radar should be a no brainer. The first top on our Kent winery tour began at Gusbourne Estate, located the furthest Southeast, on low slopes where the sea used to be. The majority of their 90 hectares of vineyards is located on this marsh, just 6 miles inland. The soil, comprised of clay and sand, has ideal drainage and sun exposure across these low slopes. The rain tends to follow a southeast pattern, keeping the winery dry and sunny. It was around 55 degrees last week and we were told that it didn’t snow at all this winter, if that gives you an indication of their optimal weather conditions. The winery was founded in 2004 by Andrew Weeber, a surgeon with a passion for Champagne. Grape vines had never been planted on his estate, and the ones today were brought over from Dijon. They are all planted North to South, due to the constant Southwesterly winds. The only pests here are birds, but they are easily managed by moving a silver balloon around the vineyards, since apparently, they despise change. Today, Gusbourne is producing almost exclusively sparkling wine and we were able to taste their top three produced each year. All of their Sparkling wines have seen some amount of time in oak, for texture purposes. Over 1,000 oak trees grow on their property, and they have only found one to make a few English barrels out of. The rest of their wood comes from France, including large foudres from Burgundy. 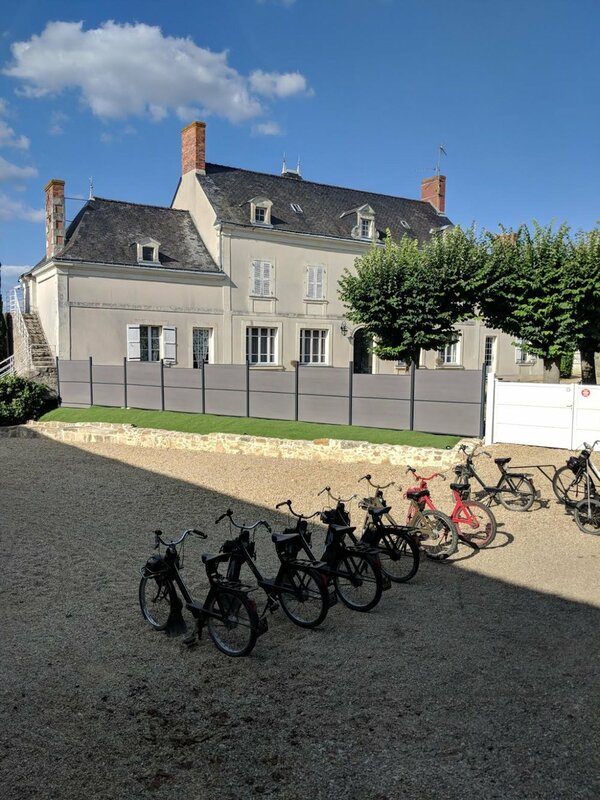 The tasting included their 2015 Rose (54% Pinot Noir, 32% Pinot Meunier, and 14% Chardonnay), the 2014 Brut Reserve (60% Pinot Noir, 22% Chardonnay and 18% Pinot Meunier), and the 2014 Blanc de Blancs (100% Chardonnay). All impressive, full of acidity and slightly mineral, the resemblance to Champagne was uncanny. Our tour continued at Chapel Down, not just a winery but brewery and distillery as well. Like most of Gusbourne’s vineyards, their property was actually where the coastline came to in the 12th century. They decided to plant vines in the 1970s, when Steven Skelton, MW bought this 26 acre hop farm at the time, and started from scratch. All of the vines were planted on southwest facing slopes, for optimal sun exposure. One grape that flourished during Skelton’s planting experimentation was Bachhus, a crossing between Riesling, Muller Thurgau and Silvaner. This grape was one of the only to ripen properly for the production of wine. Today, the estate has more options in terms of varietals that work, due to global warming. After tasting the Bacchus, it almost reminded me of a Sauvignon Blanc from New Zealand, with ripe, tropical fruit on the nose and palate. 2018 was their largest harvest to date, producing over 15 million bottles from their 600+ acres of vines! That makes Chapel Down the largest producer of wine in England, with an output covering 1/8th of the entire production. The grapes for their sparkling wines are planted across 300 acres in Kent, with a similar climate and soil to Champagne. Chapel Down’s production is approximately 50% Sparkling wine, with Chardonnay, Pinot Noir, Pinot Meunier, and Pinot Blanc (for the NV). They’ve transitioned to single guyot planting only, which has resulted in fewer bunches and higher quality due to lower yields. The tasting started with still whites, like Bacchus, Pinot Blanc, Chardonnay and even Albarino. The Albarino was quite interesting, aged on the lees, 30% of which in used oak. My notes included braised apricot, honey and lemon peel, with a bit more acidity than the familiar, Spanish version. We went on to taste the Sparkling wines, beer, cider, gin and vodka, when I said “ok, this place really manages to do it all.” In fact, they make the first ever gin from Pinot Noir grapes in the world! It was quite delicious. Hush Heath is constantly planting new vineyards, the latest being just last spring. All pruning and picking is done by hand, and they don’t use any irrigation. Similar to the other wineries visited in England, Hush Health focuses on the 3 Champagne grapes, and produces mainly sparkling wine. In fact, all of their equipment comes from Champagne, minus the bottling line. They gently press their grapes to retain acidity, a process that takes over 4 hours to achieve. Hush Heath also believes in very cool fermentation, as warming it can change the character of the grapes. The estate uses a combination of French and American oak, and usually use them in the production of their sparkling wines. The tasting involved a few still and sparkling wines, which were quite impressive. Among them was the Pinot Noir, from vines planted in 2002. The unoaked wine was very elegant and earth-driven, old world in style. This was the first still red wine from England that I’d ever tasted and proved to be quite promising. 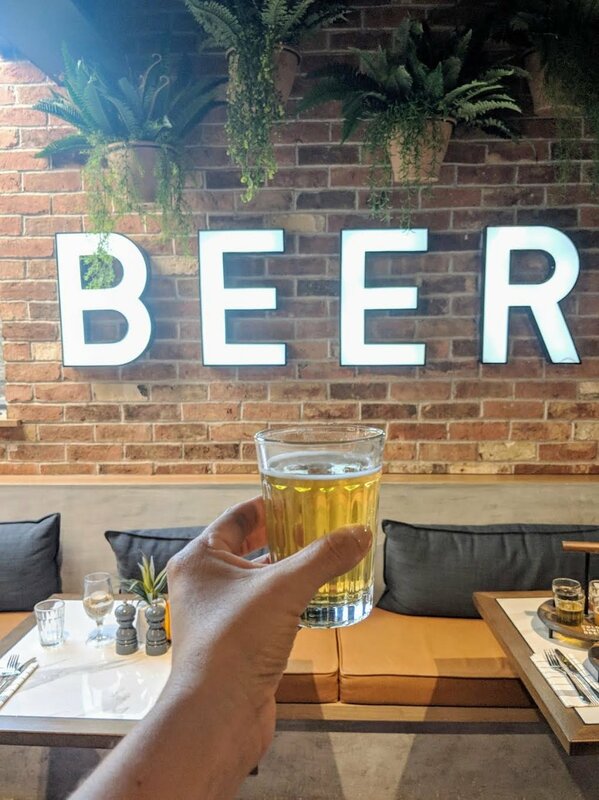 This Edinburgh walking tour started and ended at a brewery, with tastings and a whole lot of history in between. We learned all about Scottish beer, from the 1100’s to the rising craft beer scene today. Our first tasting was at Summerhall, with a selection from Barney’s Brewery in Edinburgh. The lineup from this local microbrewery included a sour, a red ale, a pale ale and an IPA. The IPA, Cool Beans, was actually made using 40% faba beans and 60% barley. It was brewed with a strong, malt and a mix of new world hops that resulted in a very drinkable, well-balanced beer. Our second brewery stop was the recently opened, Cold Town Beer brewery and restaurant. We enjoyed a flight of four beers, including their flagship craft lager, bright and drinkable and just 4% alcohol. If you’re a beer and history buff, add this tour to your Edinburgh itinerary. This was the perfect tour for Scotch pros and newbies alike. It starts in a virtual distillery, where you get to ride through the production phase in a mock barrel. Then, you’ll learn all about the Scotch producing regions with a film and scratch n’ sniff card to help you identify the differences in style. Finally, the guide takes you into the Library, where you’re surrounded by the largest collection of Scotch in the world as you taste and compare single malt and blended Scotch. I’ve never been one to claim expertise when it comes to spirits, but after this tasting I felt like the Scotch pro I’ve always wanted to be. This was a sensory journey I won’t soon forget. Also, be sure to dine at their restaurant, Amber for a traditional, 3 course dinner and Scotch pairing! The infamous Beefeater distillery is located in the heart of London, and shockingly makes all of their gin right there in the facility. The tour begins in their Gin Museum, with historic articles and stories about how gin became so popular in England, as well as how Beefeater came to be. Their 1800’s gin recipe still remains the same today, and the tour guide urges you to smell each ingredient as you make your way to the Gin Bar for a classic Gin and Tonic. Located in the Malton, this lovely distillery specializes in Mediterranean-inspired herbs and botanicals for their beautifully fragrant gin. Rare Bird distillery also offers a “Gin School,” allowing gin lovers to create their own concoctions, with dozens of ingredients to choose from. What a blast! 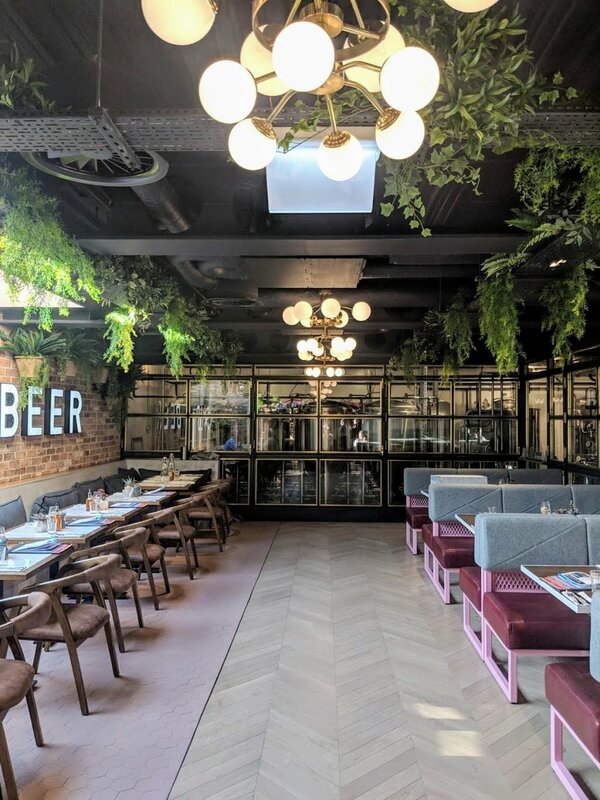 · London: Sketch (situated in an 18th-century townhouse, this magnificent restaurant specializes in afternoon tea, complete with three courses of nibbles, caviar and champagne), Dishoom (Inventive Indian cuisine in a massive, antique warehouse. Just make sure to get a reservation), The Cheese Bar (any cheese lover’s most indulgent dream come true. 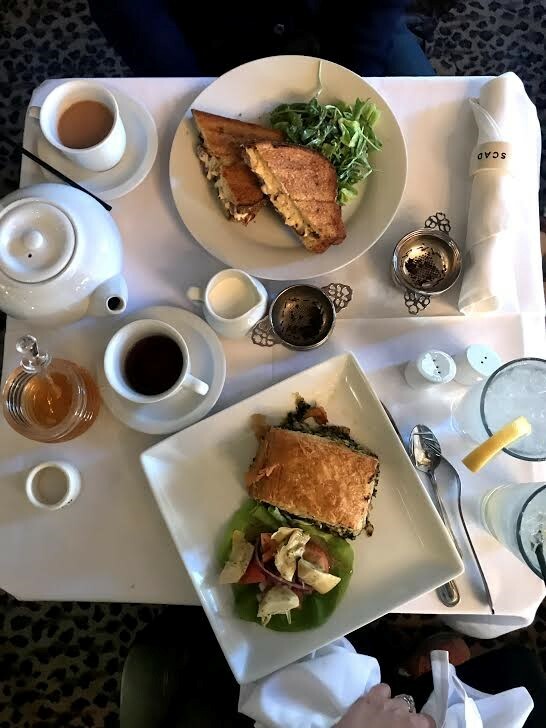 Dive into their massive selection from independent purveyors before lunching on their renowned staples, from burrata to fondue and grilled cheese to and mac n’ cheese), The Ned (This stunning hotel has several bars and restaurants in their magnificent 20’s building. 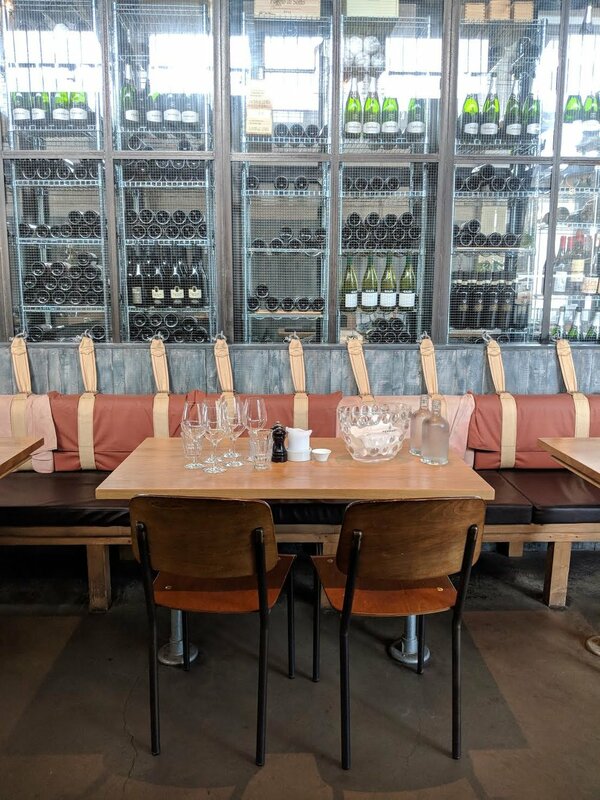 I enjoyed oysters and a classic burger inside Millie’s upscale dining room), Noble Rot (An absolute must for wine lovers, this wine bar and restaurant has a huge selection of wines by the glass and Burgundy by the bottle. Yes, from the same guys who brought you the industry-obsessed wine magazine by the same name). Last but not least, and for my tea aficionados, The East India Company has a massive selection of not only tea, but coffee, chocolates, and gin. Over a short tour and tasting, we learned all about where the different types of tea come from, how long to steep, and the perfect temperature to enjoy your favorite styles. 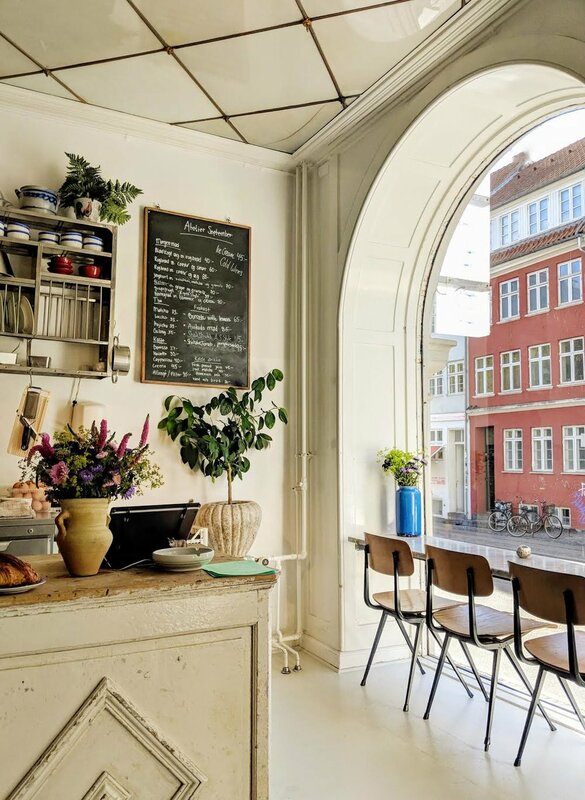 · Edinburgh: The Little Chartroom (A tiny, super trendy spot owned by four food and wine pros. 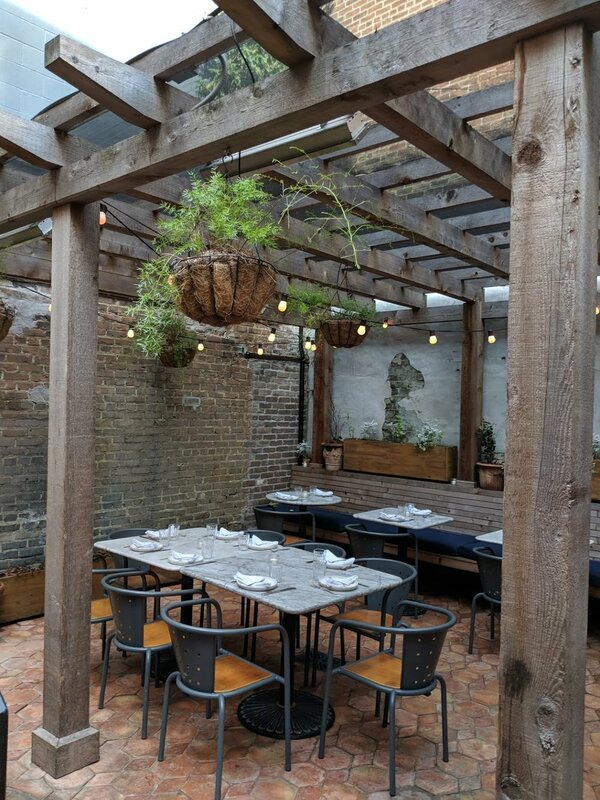 Expect seasonal and creative plates and an impressively rare wine selection), 27 Elliotts (Food stylist turned author and restaurateur, Jessica Dennison’s relaxing, neighborhood favorite offers daily brunch along with a supper club style feast on Friday and Saturday nights). Cranachan & Crowdie, not a restaurant, but the loveliest shop for authentic Scottish products. We tasted their delicious cheeses, meats, chutneys and local gin before picking up a few wood and tweed souvenirs. · Malton: The Talbot (Locally sourced, Yorkshire ingredients in the most beautifully designed hotel. Expect fresh fish, local game and unique cocktails). Anyone who’s been to Napa Valley can undoubtedly recount the region’s magnificent landscape, remarkable cuisine, and unparalleled wines. I can still remember driving through Rutherford and Oakville, with renowned estates I’d only read about on either side of me. Winding roads revealed forests full of redwoods and pine trees, with nothing but rolling hills of vineyards on the horizon. If you have yet to explore this stunning and world-renowned wine region, now is your chance, because I’m giving away a luxurious trip! 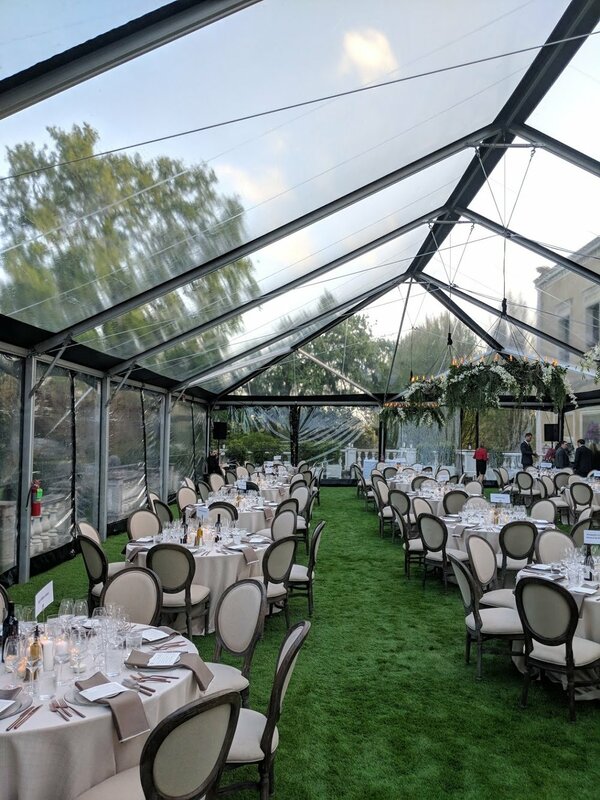 This unforgettable Napa Valley experience includes travel vouchers from Alaska Airlines, luxury lodging at River Terrace Inn, an exotic Ferrari driving experience, hot air ballooning, Bentley limo ground transports, a Napa chef cooking experience and an exclusive dinner with French winemaker Philippe Langner. Philippe Langner is the owner and winemaker at Napa’s Hesperian Winery. He is a master viticulturist and applies a lifetime of knowledge to the curation of his eminent wines. His world travels and varied experience from Bordeaux to South Africa has clearly contributed to his profound aptitude. Philippe’s passion and meticulous nature was enhanced at UC Davis, where he completed double Masters degrees in Agronomy and Agricultural Economics. 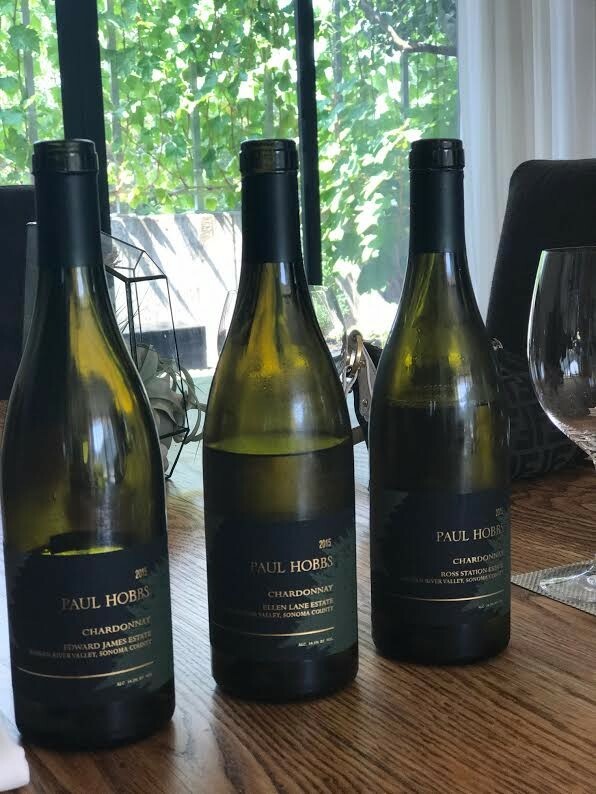 Philippe explains he “learned the importance of small but critical enhancements in the vineyard.” Today, his brilliance and precision are widely recognized as he consults on some of Napa’s most esteemed wineries. Philippe believes that working hard in the vineyard is the best method for achieving optimal fruit. If you follow his advice, the winemaking should be simple, and in-turn the wines will speak to their place, exhibiting ideal, terroir-driven characteristics. 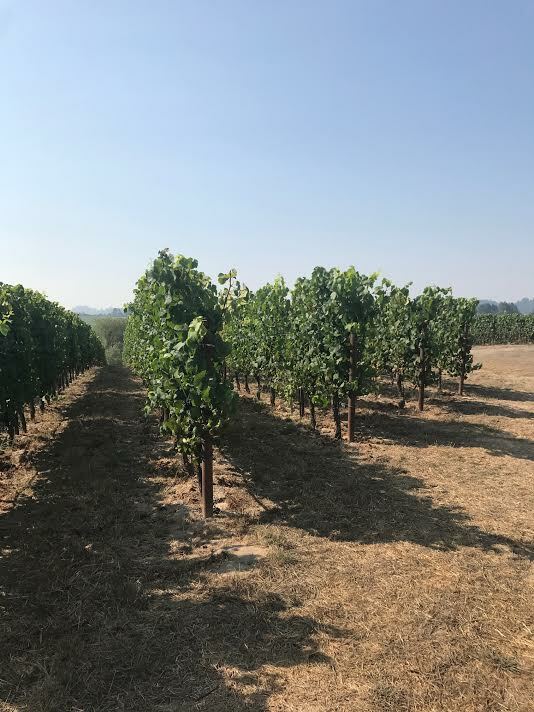 Hesperian Winery is located within the notorious Atlas Peak AVA, where Philippe’s steep and rocky Kitoko Vineyard is situated. Philippe planted Cabernet Sauvignon here back in 2000 and 2003, and today these vines are entering their prime. Due to the rocky soil and steep situation, the vines are quite low yielding. This results in an elevated level of complexity in the finished wine. Notes of huckleberry, leather, blackberry, peppercorn and tarragon came across my palate in the 2015 Cabernet Sauvignon, the estate’s staple wine. All of Hesperian’s wines are bottled unfined and unfiltered, and new oak is incorporated cautiously. Upon tasting, it was clear that the Cabernet Sauvignon was built to age, however it was easy to relish now. The wine paired beautifully with a grilled leg of lamb and portobello mushrooms. I incorporated pungent, piney herbs like rosemary and thyme in the dish, which brought out the wine’s herbal characteristics and earth-driven features. Hesperian Winery strives for finesse and purity in their wine but modestly believe that each year is an opportunity to improve. Experience Napa Valley’s exquisite food and wine with this seasoned professional before witnessing the tapestry of vineyards from above, in a hot air balloon. To enter the giveaway, simply head over to www.hesperianwines.com/contest and add your information to their mailing list. The giveaway closes at midnight 12/20 and the winner will be announced on 12/21. Must be 21 or over to enter and located in the United States. Happy holidays and best of luck! From the rolling hills and morning fog to the unique cuisine, beautiful architecture and incomparable wine, my trip to Piedmont was nothing short of spectacular. You won’t find pizza in Piedmont, in fact the diverse cuisine is heavily influenced by neighboring France, with meat and cheese at the focus. Another similarity to France was the local dialect, a language still spoken that’s genetically closer to French. Piedmont is known for the production of Nutella, Arborio rice, Fiat cars, the Borsalino hat, and of course, as one of the most famous wine regions of the world. Similar to many of the greatest wine-producing regions, much of Piedmont’s vineyards were once under the sea. Many of the wineries I visited even displayed some artifacts found in their vineyards, such as seashells and crustaceans. Today, the geologically diverse soil is comprised mainly of alluvial, clay, sand and marl. The hillsides can be quite steep throughout Piedmont, making it necessary to work many of the vineyards by hand. The top three wine producing areas of Piedmont are Monferrato, Roero, and Langhe. Fortunately, I was able to visit all of them, in that order. This stunning and secluded hilltop resort also has winery at the property from the same name. 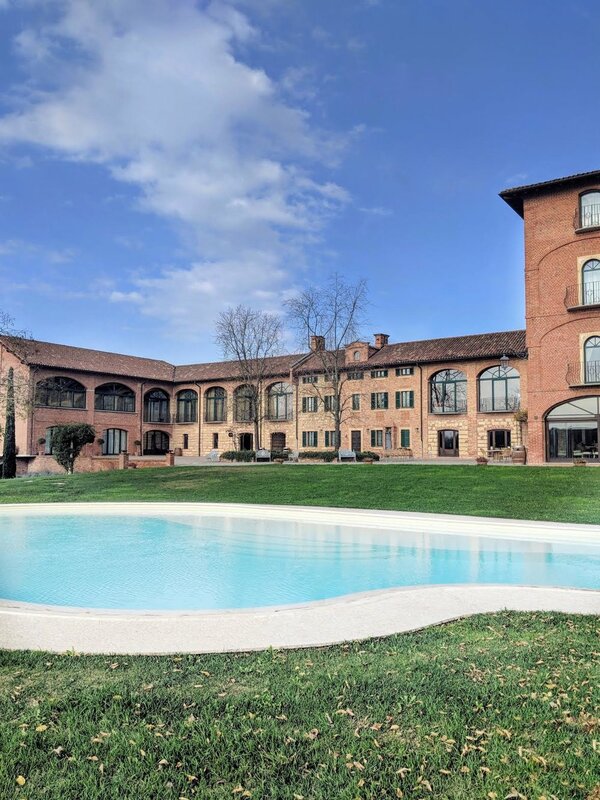 Surrounded by vineyards and an infinity pool, I highly recommend this relaxing estate when in Piedmont. I met with Director Marco Fasoli, who manages the winery and hospitality program. Marco gained most of his experience as the Director of Business for world-renowned estate Marchesi Antinori. In addition, Marco works with the restaurant on creating innovative cuisine, as he’s also an instructor at the ICIF (Italian Culinary Institute for Foreigners). The Montemagno Winery is certified organic and produces approximately 180,000 bottles per year. They have been exporting to the USA and Europe for approximately 5 years. Marco led the tasting with several whites, reds, and sparkling wines. Among my favorites was the 2016 Solis Vis, a high acid white wine from the Timorasso grape. Marco explained that Timorasso is harvested after the red wines, and requires extreme ripeness on the vine. It also performs best when planted on clay soil, which offers more of a full structure than the red clay, planted to Barbera and Grignolino. The mineral-driven Solis Vis had notes of ripe melon and seashells. Perhaps the most interesting tasted were the two sparkling wines from Barbera. Both produced in the traditional method and hand-riddled still today, their names “24” and “36” signify the time they spent on the lees. The “36” was especially aromatic with orange peel, mint and red berries on the nose. Among the still wines from Barbera, the 2015 Barbera Mysterium was full of black fruit, menthol, and incense. This full-bodied wine comes from their oldest vines, which are approximately 90 years old. Marco enlightened me with his views on Barbera, explaining that it’s “kind of an ignorant grape, and actually requires good winemaking, unlike other varietals. It definitely needs oak for structure.” The winery also produces a fantastic Barolo from La Morra in the Langhe. Legally, the wine must be fermented and produced there, to be labelled as Barolo. The aging process can be completed at the estate, however. Montemagno focuses on lowering sulfites in any way possible. This is achieved using traditional methods and innovative technology. For example, the red wines are neither punched down nor pumped over. Instead, Montemagno is utilizing Nectar technology, which involves a delicate second fermentation by temperature control. The white wines undergo a soft pressing and carbonic maceration with dry ice, to preserve delicate aromas. Owned by Malvira winery, and ran by the winemaker’s wives, this beautifully designed hotel dates back to 1750. Owner and winemaker Roberto Damonte led me through the stunning hotel, pointing out each of the insanely steep vineyards surrounding the property. Complete with a beautiful restaurant, tasting room and swimming pool, this historic hotel is an absolute must. My pink suite (below) had antique furniture and a newly remodeled bath. It was the perfect balance between old and new. Roberto led me through Malivra winery and cellar before we started the tasting. His father started the winery in the 1950s and he and his brother took it over in 1973. The estate has been certified organic since 2017. They’re producing around 300,000 bottles annually from just over 100 acres, of which about half is white wine. Roberto is focused on showcasing how red and white wines from the Roero can age. 70 years ago, Roero reds were meant for drinking quite young. This was also when there were no middle men, and the wine was going straight to the consumer. They realized the importance of producing high quality wines that could be enjoyed over the course of several years, all over the world. He recognized that oak aging is necessary for Barbera, especially for long-term satisfaction. However, the percentage of small, large, old and new barrels varies each year. His goal is to remain consistent in terms of flavor, keeping the consumer unable to recognize much of a difference from vintage to vintage. This can be difficult to achieve with weather fluctuations, as you can probably imagine. For example, the 2018 vintage will have a slightly lower production since there was a bit more rain than last year. Roberto explains that white wine has a reputation of being drank quite young, but that is not the case for his Arneis today. As we began the tasting, I couldn’t agree more. Malvira is especially known for their Arneis, though relatively new for the region of Roero as a whole. 40 years ago, over 95% of Roero was planted to red grapes and today it’s closer to 50%. The grape is intensely aromatic and complex, which is likely the reason behind its recent popularity. Malvira’s 2014 Roero Arneis Vigna Renesio had me most intrigued, with vibrant citrus aromas, high acidity and impressive minerality. This comes from the most historic vineyard for Arneis, where the first record of the grape was found in 1478. At 3 years old, this wine is perfectly ready to drink, with lively evidence of calcareous soil. The 2015 Roero Arneis Vigna Salietto was partially aged in oak (about 50% of the total wine), but not apparent to me, the wine simply showed more ripe fruits like melon and lime. Among the red wines, the 2016 San Michelle Barbera stood out with vivacious plums and berries, followed by poinsettia and pine. This is my idea of the ultimate holiday wine. 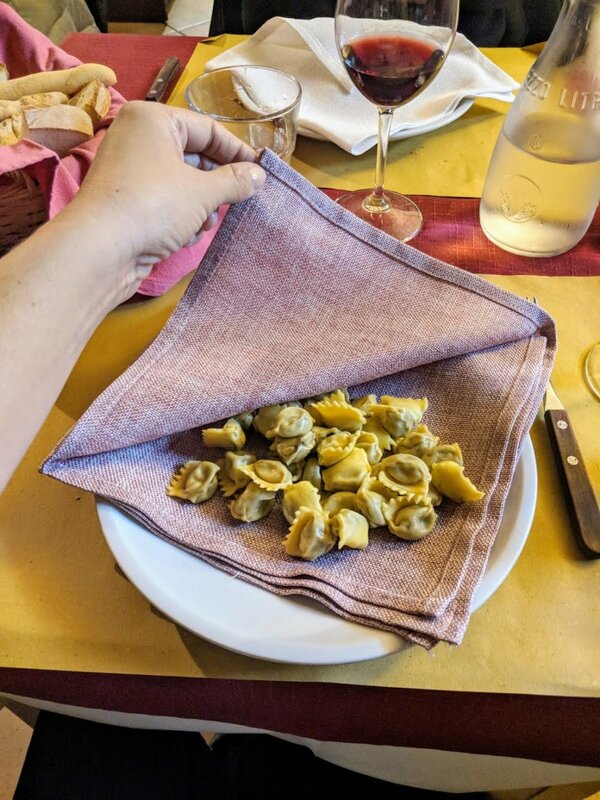 We had dinner at the fabulous Enoteca Regionale del Roero (one Michelin Star), where I tasted Tajarin for the first time. This egg-based pasta is like a rich linguine from heaven. Commonly served with beef ragout, ours came with shaved white truffles. I visited Cantina Comunale “I Sori,” an Association that focuses on Dolcetto from Diano D’Alba. 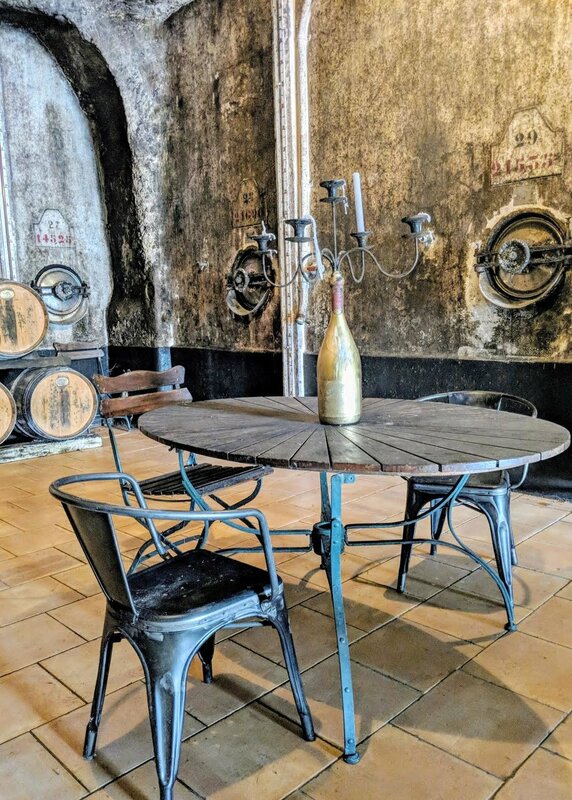 This tasting room is in the heart of Diano d’Alba and had dozens of producers that specialize in not only Dolcetto but Barbera and Nebbiolo as well. Two DOCGs exist for Dolcetto, Diano d’Alba and Dogliani. Many agree that the Dolcetto from Diano is more elegant than Dogliani, which can be quite full bodied and masculine. While often rough in tannin, Dogliani is known to age longer. Diano d’Alba is best enjoyed while only a few years old. Many producers in this area have winemaking habits that last for generations. While the innovation is there, the recipe stays the same. 40 years ago, you could actually make Barolo from Diano d’Alba but back then, Dolcetto was more popular. Dolcetto is a difficult grape to harvest, especially in bad weather. It’s a small berry with thin skins and it’s quite easy to break if you aren’t careful. We tasted ten wines by “Sori” or vineyard site, which is similar to France’s cru system. The 2017 Claudio Alario’s “Sori Costa Fiore” was one of the most complex, in my opinion, with notes of strawberries, Asian spices and herbs. He also produces a wine from the Pradurent Sori that he ages in new oak, something relatively unique for the varietal. It wasn’t my personal favorite but resembled Barolo a bit for that reason. The 2017 Renzo Castella Sori della Rivolia also opened up beautifully, but it will clearly need another 5 months or so to even itself out as the tannins were quite tight. Josetta Saffirio was the next winery visited, and one that I had personal experience selling and pouring over the past 7 years. Located in Monforte d’Alba the family has five generations and over 200 years of experience in viticulture and vinification. The small team of just five people employ ten more through a co-operative during harvest. Their five and a half hectares are farmed organically, and over 70% of their production is Nebbiolo. The winery focuses on sustainability and social responsibility, and even insulated the perimeter with natural cork to reduce heat. They care for the environment throughout the entire wine making process. The tasting began with a sparkling Nebbiolo rosé, which was the first I’d ever tried. The wine spent 6 hours on the skins to impart a stunning, rose gold color. With just 5 grams of sugar per liter, it is considered Brut. This is Josetta Saffirio’s only sparkling wine and they produce about 5,000 bottles of it per year. They are one of the only estates in Piedmont (and the world) producing a sparkling style of Nebbiolo. The nose was a bit restrained but the palate revealed stunning complexity, especially floral and herbaceous notes. The light body and high acidity kept this wine very refreshing, making it quite easy to enjoy more than one glass. We moved on to the reds, starting with the Langhe Nebbiolo and ultimately three vintages of Barolo, 2012, 2013 and 2014. We discussed the 2014 vintage which didn’t have the highest reputation at the start. Now, Piedmont’s best winemakers are noticing it’s potential and Barolo from 2014 is being described as multifaceted, with tertiary, complex aromas. I picked up notes of orange blossom, chive, pumpkin and earth-driven granite. While 2014 Barolo may not age like the warm and fruit-forward 2015 vintage, at least we won’t have to wait to drink them! 2013 was a much warmer vintage for the estate, and their Barolo from this year has 15% alcohol, compared to most others at 14.5%. It was rich and had a raisonated fruit quality. The 2013 Barolo Persiera vineyard had notes of licorice and raspberry jam, along with a full body and high tannins. Clearly, this wine is built to age. The 2012 Barolo Riserva was herbal and complex with notes of balsamic, rosemary and white flowers. While perfectly ready now, this wine has a long life ahead. Gigi Rosso was the next winery visited, in Castiglione Falletto, the heart of the Barolo area. Today, the estate is ran by Maurizio Rosso, Gigi’s son. Maurizio has decades of experience in winemaking and he’s also the author of “the Mystique of Barolo,” a personal chronicle of his life-long love affair with Barolo and the Nebbiolo grape. Maurizio led me through the winery with his son Andreas, an integral part of their operation. The family has a rigorous respect for local winemaking, and even have a collection of antique winemaking tools in their cellar! Perhaps the most fascinating part of the cellar, however, were the botti (huge barrels), which were the largest I had ever seen. Andreas explained that they’re eight centimeters thick and currently about 45 years old. With proper scraping, they should last another 20 years. As you might imagine, these old and extremely large botti rarely convey oak characteristics in the wine, which is precisely why Gigi Rosso utilizes them. Gigi Rosso has a total production of 100,000 bottles and 65% is exported. The estate makes a wide range of wines, and owns vineyards all over Piedmont. For instance, they make 2,500 bottles of Arneis from a newly acquired vineyard in Roero. They estimate a full crop of 4,000 bottles next year. The winery is also making barrique-aged Chardonnay. This Burgundian style is fermented 6 months sur lie and comes from one of the highest vineyards in Diano d’Alba. The high elevation and eastern exposure compliment the chalky soil for production of Chardonnay in this area. Due to climate change, other growers nearby have been replanting with Chardonnay (and even Viognier) vines as well. Moving on to the red wines, Gigi Rosso’s Diano d’Alba Sori del Moncolombetto (Dolcetto) was very complex, with soft tannins and a nose full of cherries, blossoms and tobacco. Maurizio prefers not to label the wine as Dolcetto, however since some people (mainly Italian) tend to mistake it as “dolce,” meaning sweet. This wine is most definitely not sweet, but rather a zippy and easy-drinking dry style. The 2015 Nebbiolo Superiore spends 18 months in barrel, which is 6 months longer than necessary for including “Superiore” on the label. The light garnet color followed with surprisingly high tannins and acidity to match. The 2015 Barbaresco was quite approachable with soft tannins. The flavors were elegant, with dried herbs and spices on the nose. The 2014 Barolo is a blend of three of Gigi Rosso’s vineyards. The long finish was astounding and notes of ripe cherry, strawberry, roses and dried basil continued to arise after the several times I returned to it. I was fortunate enough to stay at Maurizio’s guest house, just 5 minutes from the winery. The two bed/two bath was much more than enough room for me, and it would be perfect for a family or two couples. Waking up to panorama vineyard views in the heart of the Barolo area was such a treat. I highly recommend booking his beautiful home, if available! My last day began at Cascina Castlet in Castiglione, operated by the renowned Maria Borio. Maria has inherited 31 hectares of vineyards in Costigliole d’Asti from her family since 1970. She is notorious throughout Italy and truly an outstanding winemaker and businesswoman. She offered an abundance of history while leading me through the winery and tasting. Over half of the estate’s production is Barbera, followed by Moscato, Chardonnay, Uvalino, Cabernet and Nebbiolo. Cascina Castlet makes a few different styles of Barbera. The first is a rather simple, “Nouveau” style that’s meant to enjoy each year before Christmas. There’s still a bit of CO2 and residual sugar in this wine. The label is an image of Maria and her cousins riding a Vespa from the 1940s. The Vespa was an icon at the time, as it was the first affordable mode of transportation. It symbolizes a sense of freedom or rebirth. At that time, Barbera was rather low in terms of quality, but Maria’s family began to believe in the grape. They realized that Barbera could age for decades and that the possibilities were endless. Similar to the Vespa, this simple wine is affordable and showcases the history of this region. The second Barbera is meant to enjoy before Easter. When producing this style, the winery doesn’t use heat in the cellars, rather they wait for the Spring temperatures to do the work. There is no residual sugar left in this wine and it’s aged in cement tanks before being transferred to stainless steel. 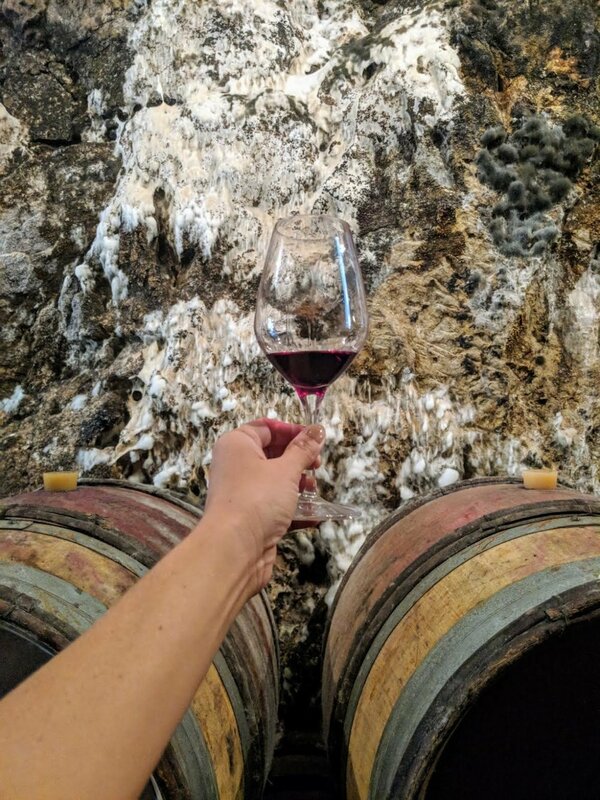 Lastly, the third style of Barbera is called “Litina,” and is the best production from the prior (second style) that the winemaking team puts into oak for six months to one year. This is easy to sell and enjoy for years and historically provided the family with a constant cash flow. It is low in tannin with a round body, and Maria explained that the fruit is still this intense after 10 years, which is when the tertiary aromas start to reveal themselves. Since this region of Monferatto doesn’t have Barolo or Barberesco, Barbera is their prize. For this reason, “Litina” has the flagship logo of the company on the label. This wine had notes of morello cherry, ripe plums, oregano and mushroom. Litina is the nickname of Margherita, Maria’s aunt who passed on some Barbera vineyards to her. We proceeded to taste some very unique wines, such as the “Passum,” a Barbera produced in an appasimento style. This tasted like Amarone but more fresh and easier to drink. Today, the grapes raisonate on racks for one month, in a controlled air ventilation room immediately after harvest. Then, 20% of grape must is added before aging in a mix of botti and tonneaux. Next was the “Policalpo,” a field blend of Cabernet Sauvignon and Barbera vinified together before aging one year in barrique. This full-bodied style is meant for exporting and sort of their version of a Super Tuscan. Finally, we tasted the notorious “Uceline,” produced from the almost-extinct varietal Uvalino. After finding a few of these unknown vines dispersed across their vineyards, Cascina Castlet proceeded to do some intense research and DNA studies. Many believed that this forgotten grape was extinct, and Cascina Castlet has the only two hectares in the world! They are currently making 5,000 bottles of this wine per year, and the yields are similar to those at Chateau d’Yquem. “Uceline” is always made in a sweet style because it’s resistant to mold. 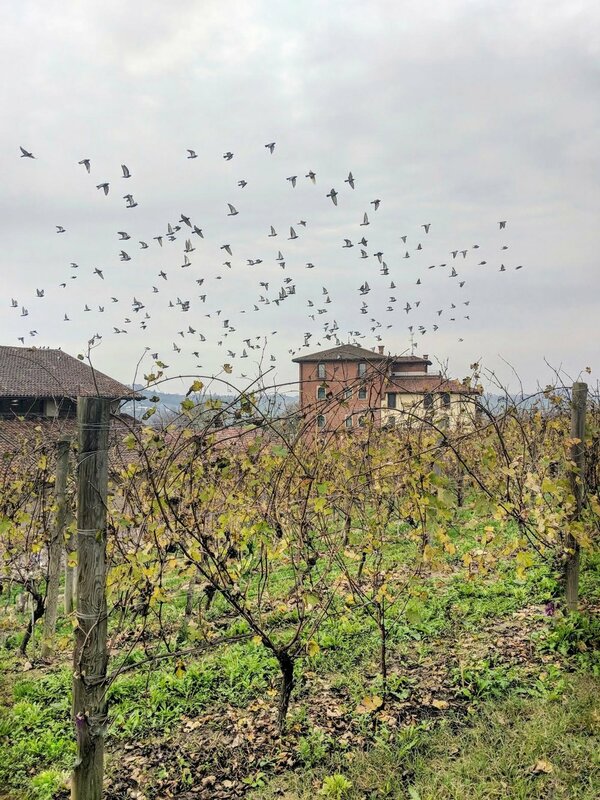 The name, “Uceline” translates to “birds,” because they keep some clusters on the vines as long as possible to attract the birds. These crucial birds eat unwanted insects before harvest and feed off the sugar in the Uvalino grapes. They produce the wine by letting the grapes dry, in an appasimento style. Since it can age indefinitely, they release it whenever they like. It tasted like a great Amarone, with a lighter body and more acidity. Cascina Castlet also makes a few phenomenal white wines such as Chardonnay and Moscato d’Asti, which I highly recommend tasting. La Strette winery is situated in Novello, one of Barolo’s 11 villages, among Piedmont’s most renowned producers. There are only ten wineries in Novello and the name “La Strette” translates to “narrow road,” which you’d likely notice on your way to the winery, especially back when it was given the name. The estate is 25 years old but the family has a long history of vineyard management. Brothers Mauro and Savio Daniele inherited the winery and vineyards from their parents and specialize in the production of Nebbiolo, Barbera, Dolcetto and Nas-cetta. In case you weren’t familiar with that last varietal, Nas-cetta is a very rare white grape, indigenous to Novello. In fact, when Le Strette started making it, they were one of just two producers in Piedmont. Today, several estates have followed in their footsteps. It took laborious research and DNA testing for them to figure out what the grape was, however. It was only in 2001 that the grape was registered as a local varietal. In 2003, wineries were able to label their Nas-cetta as Langhe Nebbiolo, DOC. The grape is late to ripen and not too high in acidity, especially for being from Piedmont. The 2017 has distinct minerality and salinity across the palate, along with tropical fruit and exotic flowers. Mauro and Savio own six and a half hectares of this grape and produce approximately 25,000 bottles per year. They also make a single vineyard Nas-cetta from their “Pasinot” vineyard. The vines here are quite new, however after hand-selecting each plant at the University of Turin for their nursery of clones just 3 years ago. 2018 will be the first vintage with these new plants. I tasted the 2017 of both wines, which are skin-contacted, and thus considered orange. I found nectarine, herbs, and tropical flowers on the nose, very complex and aromatic. Savio explained that the grape tends to develop flavors you might find in Sauvignon Blanc, with the tropical aromas turning more citrus over time. Of the estate’s red wines, Dolcetto ripens first. They only allow one week of skin contact before aging in stainless steel only. La Strette is making about 2,000 bottles each year, as a tradition. Savio described this as “a whole meal type of wine, great with everything from appetizer to entrée.” I considered the 2017 more fruit-driven than others tasted on this trip, with strawberries, black berries and peach candy on the nose. The 2016 Barbera Superiore comes from “Persole,” where 80% of the vines are older than 80 years. At around 400 meters above sea level, the limestone soil gives this wine elevated concentration and structure. It has less tannin than the Dolcetto, but much fuller in weight. For Barolo, La Strette strives to bottle by single vineyard. They have three in total, and while they vinify separately, some vintages result in the estate blending one or two together. For example, they may not produce much from one vineyard if hail is an issue there that year. Alternatively, they might be showing similar characteristics, which was the case in 2007. Though it was a great vintage, the flavors didn’t vary much, so they ended up blending all three and producing just one Barolo that year. Thus, La Strette can make between one and four different Barolo wines per year. Their system for aging Barolo was particularly interesting for me. First, La Strette puts the Nebbiolo into small barrels for one year, of which only 15% is new, to impart color. Then, they move it into the larger botti for 15-20 months to develop elegance. I tasted the 2014 Barolo from Bergeisa and Bergera-Pezzole. The Bergera-Pezzole was very balanced and elegant, with classic notes of pepper and tar balancing the fruit. The Bergeisa was ready sooner, Savio mentioned, as the vineyard is higher in elevation, from a mix of soils that result in higher tannin and more spice. I absolutely picked up on the spice with this wine, getting notes of cinnamon and cardamom. I can always get down on some sparkling cocktails, especially in the summertime. When the east coast humidity starts to roll in, I like to host a Miomosa Party with mimosas and bubbly cocktails. 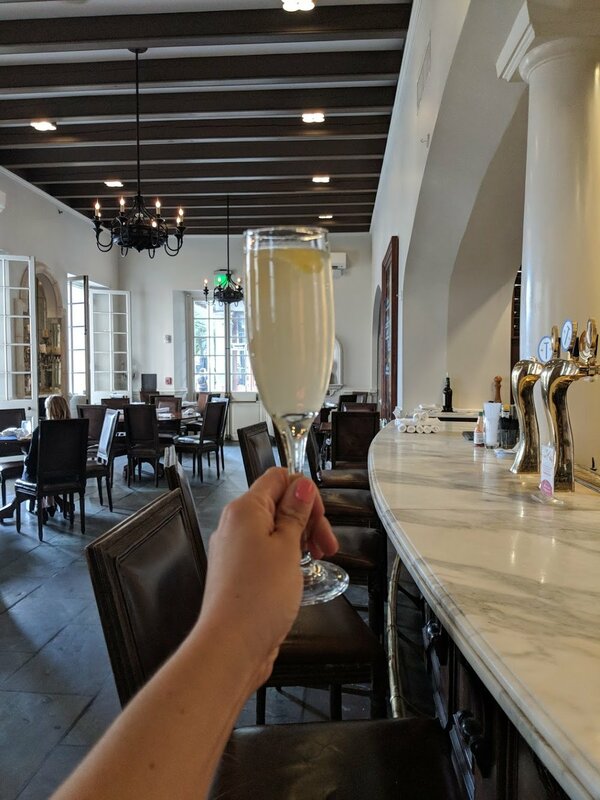 Along with the classic Mionetto Prosecco and orange juice, check out a few of my own, super easy, refreshing and slightly herbaceous Prosecco cocktails below. I recommend serving in a chilled flute or white wine glass and pairing with a fruit and cheese plate. Happy sipping! Last month, I tasted a selection of South African wines from 7 different estates, here were my favorite wines from each. This estate is known for their high altitude position in Stellenbosch, and producing wines with elevated acidity. My favorite tasted was the Sauvignon Blanc, with 4-5 months on lees. MAN estate was named after the 3 owner's wives' first initials, Marie, Annete and Nicky. They started making wine together in 2001 and now have grown to produce over 250k cases per year! My favorite tasted was the 2016 Cabernet Sauvignon. This wines is very peppery with leather and incense on the nose. the 2016 Pinotage was also very drinkable and I'm quite picky about this grape. Joostenberg is a 5th generation, organic winery in the Muldersvlei district of Stellenbosch. Little J is their entry level label and the 2017 Chenin Blanc had a ton of character. My favorite tasted here was the 2016 Family Blend (red) which has a bit of Touriga Nacional and some Malbec in the blend, which is quite uncommon for South Africa. It was well-balanced with soft tannin and ripe plums across the nose and palate. From the very warm climate of Franschhoek (summers average around 105 degrees), you can already expect some full-bodied wines. Yes, that was the case, but the alcohol was clearly in line. My favorite tasted was the "Nicholas Red" named after the winemaker's son. This big and peppery blend is about 45% Syrah, 21% Carignan, 20% Mourverdre, among others, much like a Southern Rhone style. DBG is the 2nd oldest winery in all of South Africa, producing since 1685! My favorite wine tasted was the Boschendal Brut Rosé, made in the traditional method. The blend is Chardonnay, Pinot Noir, as well as about 30% Pinotage. This is the second photo below and my notes included ripe cranberries, blackberries, chalk, bread crumbs and red apple. Delicious! Perhaps the only winery I had previous familiarity with, Ken Forrester has several labels under his umbrella. The Petit is the young vine selection, and I found the Sauvignon Blanc and Chardonnay to be light in body but very varietally correct. My favorite, however was the Old Vine Reserve Chenin Blanc, from is 42 year old vines. This had baked apples, kiwi, ginger and wet soil flavors and kept getting more complex. Mulderbosch winery is focused on land conservation and rehabilitation. They have a very sensible approach to viticulture, considering the vine's environment with each farming action. I was quite impressed with their 2017 Cabernet Rosé, with fresh strawberries and raspberries on the nose. Also, the "Steen op Hout" Chenin Blanc had a range of savory characteristics, as well as tree bark, white mushroom, and fresh parsley. This Chenin was the most Old World in style. The Rhône Valley is often known for their infamous reds like Hermitage or Chateauneuf du Pape. In fact, red wine makes up approximately 80% of all wine produced in the Rhône Valley. Since the region's whites and rosés are often overlooked, we're able to find plenty of great value. Lately, however, these styles are being increasingly produced by Rhône Valley vintners and in-turn, the popular his risen on a local, domestic, and international level. 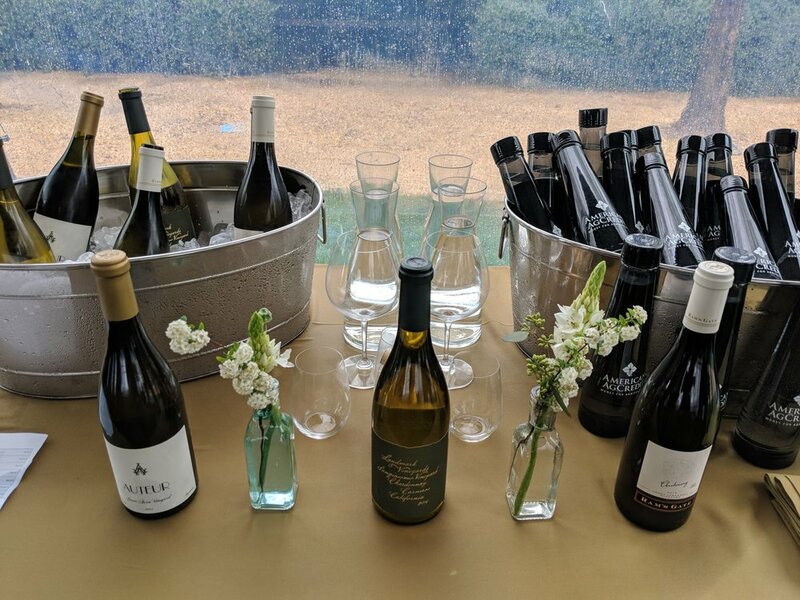 Last week, at Teuwen's "Rhône Work of Art" event, I tasted several whites and rosés from the Northern and Southern Rhône. The tasting was guided by Master Sommelier, Laura Maniec Fiorvanti, who claims the Rhône Valley as her favorite wine region. After working under Laura for over two years at Corkbuzz, I absolutely believe it. She mentioned the commonalities and differences between surrounding regions' whites and rosés. 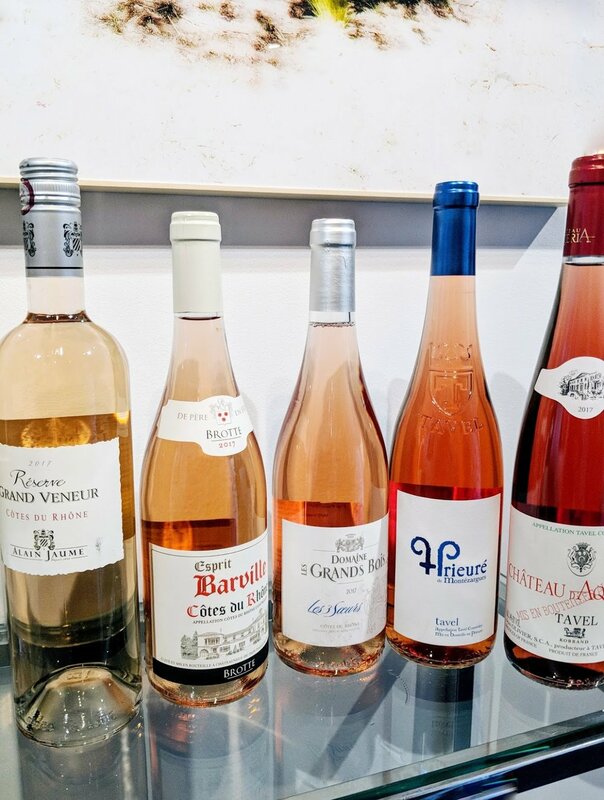 For example, rosé from Rhône tends to have more weight than the traditional style in Provence. Also, Viognier is very much Rhône's white and likely on its own in the north, rather than blended with other grapes in the Southern sub-regions. Read on for my favorites from the tasting. 2015 Cave de Tain Hermitage Blanc - A very tropical fruit-driven wine, with hints of pineapple, melon and guava. The elevated acidity and distinct minerality made this wine so memorable. At around $75, this might be more of a special occasion wine, rather than summer sipper. 2016 Jean-Luc Colombo Saint Peray - This Roussane-Marsanne blend has orange blossom and ripe peaches on the nose. A delightfully long finish, especially at $40. 2015 Domaine Bernardins Muscat Beaumes de Venise - The desert wine that will change your mind! Laura urged me to try this, knowing I've never had a sweet tooth. I'm SO glad I took her advice. This naturally sweet wine, or Vin doux Naturel has notes of caramel, candied pear, butterscotch, and preserved lemon. It's perfectly balanced with 15% alcohol. Around $40 retail. 2016 Vins de Vienne Villard Gaillard Condrieu la Chambee - One of singular Viogniers I was talking about, from the renowned Condrieu region. Notes of peaches and cream, lavender sprigs, nectarine and granite. Around $60 retail. 2017 Domaine Grand Bois Les 3 Soeurs - The most complex $12 bottle you may ever taste. This rosé is a blend of 65% Grenache, 25% Carignan, and 10% Cinsault. Notes of ripe Mcintosh apples, dried oregano, and salted quince arise on the palate. At this price, I could drink it all summer long. 2017 Prieure de Montezargues Tavel Rosé - This dark pink wine has raspberries and wet stones on the nose, with a ridiculously long and weighty finish. Around $22 retail and well worth it. 2017 Chateau d'Aqueria Tavel - A very full and luscious rosé with blueberries and fresh plums on the palate and dried herbs on the nose. This definitely craves food, with light tannin on the gums. I'd pair it with fish tacos or cod chowder. Just $20 retail! "The skin is the stage," Winemaker Jean Michel Morel responds as to why all of his white wines spend between one week and five months on the skins. He describes the varietal as "the performer," as expressing the grape varietal is his focus. Along with showcasing terroir, tasting the purity of the grape is often described as the goal for winemakers. Some enologists however, believe that skin maceration masks terroir. Stetson Robbins, owner of Black Lamb, (Kabaj's importer) assisted at the tasting and pushes back on this notion, "Why wouldn't that be the case for red wine which is almost always macerated?" Tasting the varietal first, skin included, is the intention at Kabaj, and after tasting 8 of their unique and inspiring wines, they are clearly achieving this goal. Kabaj's vines are located in Goriska Brda, Slovenia, halfway between the Alps and the Adriatic Sea. Brda means "hills," which is precisely how Kabaj's vines are situated, planted according to the varietal. Jean's wines are made "practically natural," as added sulfur is necessary for his production, maintaining his practices with controlled skin-contact. He did mention, however, that each vintage has become increasingly more natural than the last. My tasting notes with Hudson Wine Merchants' retail prices are below. Crisp and almost neutral, very light in body with a hint of peach and basil on the palate. This wine spent 2 weeks on the skin, with native yeasts only, followed by 2 years in oak, after undergoing full malolactic fermentation. Tangy, with apples, fresh pears and green leaves on the nose, spending two weeks on the skins before being macerated. Green bell peppers, lemon rind, and river-like minerality, this one reminded me of a White Bordeaux with a touch more spice and spent 1 week on the skins. My favorite if I had to choose. Very floral, with a touch of carrots, guava, almonds and mustard greens, quite complex and spent 2 weeks on the skins. The color on this one was a beautiful copper (pictured in my hand below). This is "Yellow Rebula," or Ribolla Gialla. A very orange color with a hint of burnt cashews and black tea on the nose. The tannins are apparent after spending 30 days on the skins in large oak vats, followed by 2 years of aging in oak barriques. Extremely perfumed and complex with notes of blue cheese, truffles and sherry-like flavors. This is a blend of Friulano, Rebula and Malvasia, each spent 1 year on the skins (separately) in Kvevri. The kvevri is wood-fired at a low temperature and lined with beeswax as not to soak into the ground. Plums, earth, mushrooms, this reminded me of Cabernet Franc a bit, minus the cherry red color and soft, balanced tannins. Jean's Merlot comes from one of his highest, steepest vineyards. This Bordeaux blend of Cabernet Franc, Petite Verdot and Cabernet Sauvignon tastes a lot like high quality St Julien with notes of leather, soil, pine and eucalyptus. There is a pretty, perfumed quality on the very long finish, and the wine spent two years in barrel. What other winemaker is showing their 2014 whites right now? These are clearly very special wines, well above the so-called Orange Wine fad. Jean suggests enjoying these wines cool, not cold in the summer and just below room-temp in the winter. He recommends drinking from a coup, rather than a white wine glass, as it coats the whole mouth, from each end. These wines pair with several types of dishes, due to the savory qualities. Jean recommends pork belly, dry aged meats, even Asian cuisine. I visited Bulgaria for the second time, on a wine tour with Brand Marketing Organization, World Wines. 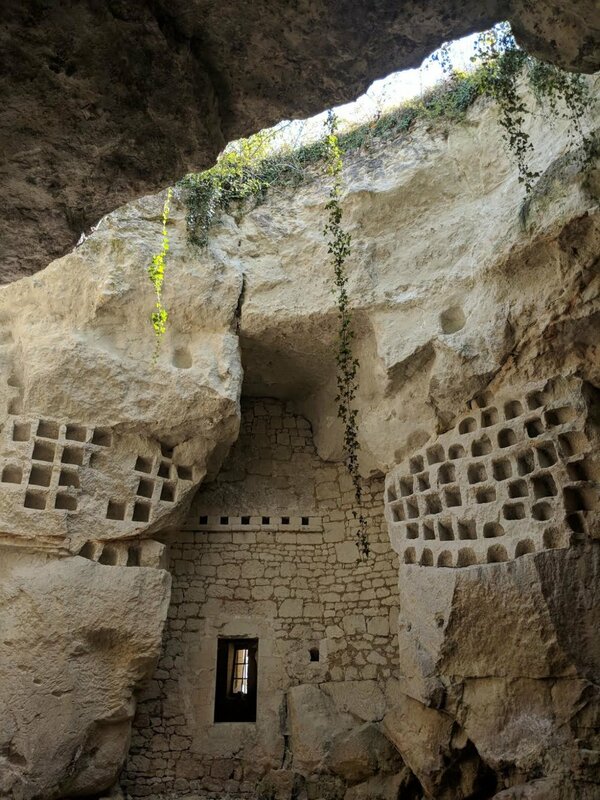 There wasn’t an ounce of hesitation on returning to the country, after falling in love with the ancient cities, unique traditions, breathtaking landscape, and of course, the wine. Once inhabited by the Thracians, Bulgaria has evidence of winemaking since 4000 B.C. It wasn’t until the collapse of communism in 1989 that the country was able to transform the market, however. Growers and wineries were now able make higher quality wine for local and international consumption, opposed to the bulk that was produced almost entirely for Russia. Subsidies and grants were issued for winemaking vessels, oak and other necessary equipment. Lately, however, this has been reduced, as the government is reserving most funding to the production of food rather than alcohol. 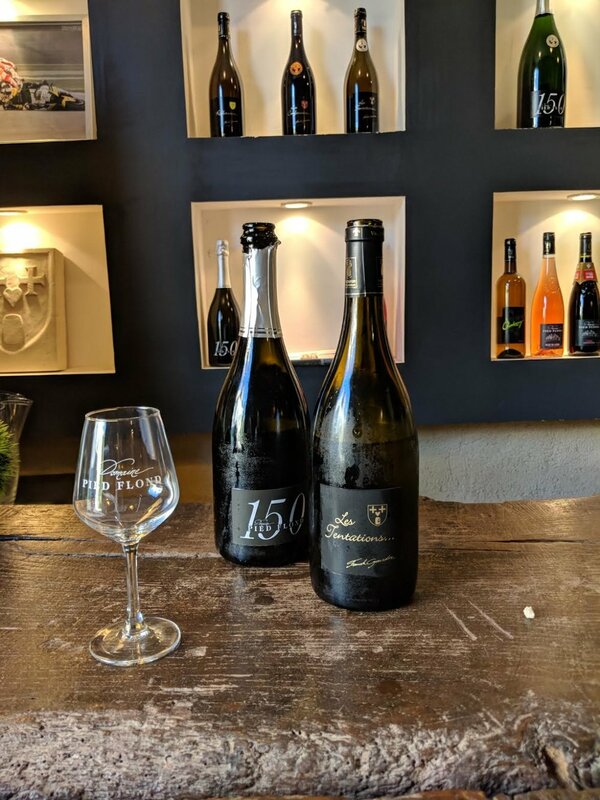 We explored the Danube Plain as well as the Thracian Valley on this trip, tasting wines made by respected producers of local and international varietals. In order, the four wineries we visited are: Bratanov Winery (South Sakar), Salla Estate (North Black Sea), Tsarev Brod (North Black Sea), and Chateau Burgozone (Danube Plain). Each unique with their own terroir and winemaking styles, comparing them provided me with an understanding of Bulgarian wine as a whole. Bratanov is a family-run project established in 2010 by a father and his two sons. They produce wine from their owned 24 hectares only, operating out of a rented warehouse just outside the town of Harmanli. Their no-frill facility allows the family more of a budget to hire knowledgeable staff. This includes Bulgaria’s “2016 Young Winemaker of the Year,” Maria Stoeva, who graduated in Dijon, France. A relatively new winery, 2011 was the first vintage (and historically their best to date). Today, Bratanov is producing approximately 60,000 bottles per year. With the purity of terroir as their goal, Bratanov has focused to reduce enzymes and they don’t cold stabilize any of their wines. They are most known for working with wild-fermented yeasts since 2016, and only filter their white wines. Their vineyards were filled with quartz along the chunky, rough soil, a bit exhausting to walk through. It was also around 78 degrees at 4pm in early May, quite unlikely for this time of year. 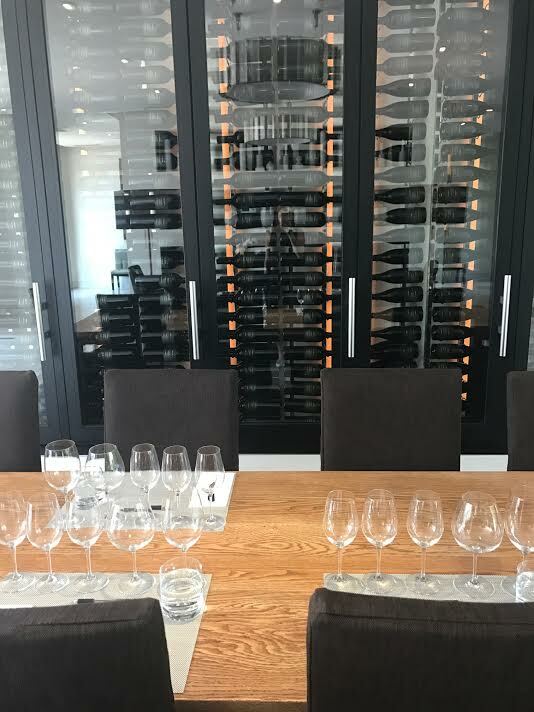 The tasting included the recent releases of Chardonnay, Merlot, Syrah, Cabernet Franc as well as Tamianka, which better known as Muscat Blanc. The 2016 vintage of Tamianka was probably my favorite, with slate minerality, smoke and a touch of florality on the nose. The unoaked 2016 Chardonnay was also fantastic, with hints of green apple and elevated acidity. We spoke a lot about the impressive acidity, when considering that this region is Bulgaria's warmest. Hristo Bratanov is one of the sons and primarily responsible for the vineyards. He explained how he's noticed that the skins of the grapes tend to thicken up when they get hot, going into a “freak-out mode,” desperate to retain the acidity inside. Of their red wines, my favorite shown was the 2015 “3 Blend” is just that, with Cabernet Franc, Merlot and Rubin (a crossing of Nebbiolo and Syrah created in the 1940s) making up the blend. As a new winery, they are constantly experimenting with blends. After tasting Rubin on its own, the tannins are quite rigourous, with espresso and stewed plums on the nose, which is why I personally prefer it in a blend. Award winning winemaker Anelia Hristakieva focuses on a very small production of Chardonnay and Riesling, among a few other white grapes. Due to their unique terroir, the winery produces very little red. 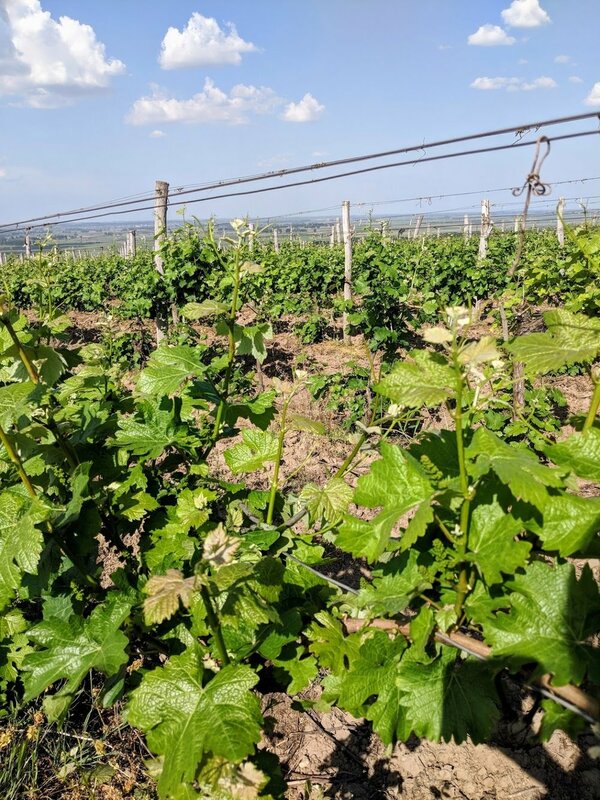 The vineyards are just 3 kilometers from the winery in the village of Blaskovo, with a few very steep hillsides planted to Sauvignon Blanc and Riesling under sandy, clay soil. 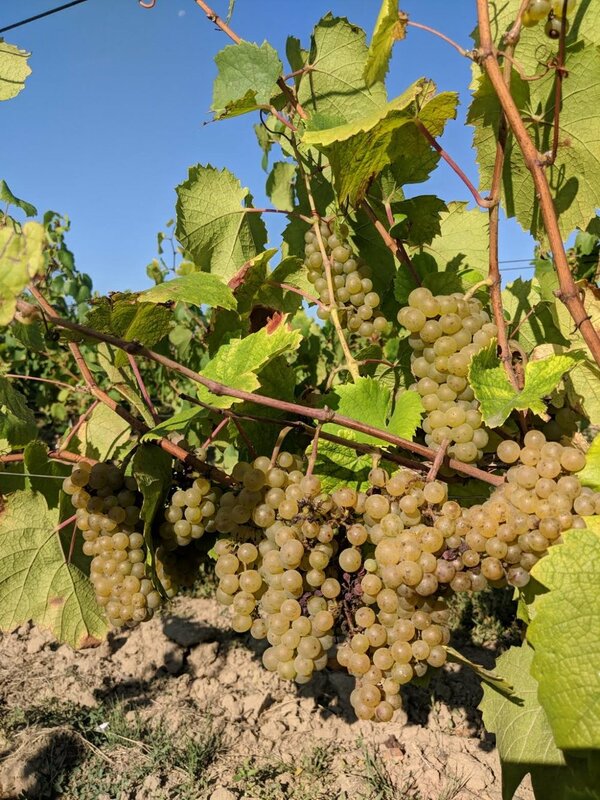 They are also producing Traminer, or Gewürztraminer which, apparently, many locals think is a Bulgarian grape due to the extensive history of plantings throughout the country. The locals also tend to enjoy oaked whites, which is why Anelia decided to oak-age some Riesling, an experiment that has gone over quite well. Anelia never uses malolactic fermentation for her whites, as to express each varietal without interference. The 2017 vintage was warm, but not hot, leaving the wines with slightly more fruit and structure. From the whites tasted, I was most enthused by the Vrachanski Misket, a rare grape produced by less than 1% of the country's wineries. With white pepper, violet and spice, it quickly reminded me of Grüner Veltliner, especially due to the high level of acidity. Also quite intriguing was the 2017 rosé, which is a blend of Pinot Noir and Cabernet Franc, vinified separately. The delightful pink wine was full of herbaceous notes and ripe, red fruit. With relatively low alcohol and a gorgeous color, much of the group was in unison regarding the freshness and balance of this wine. Salla's 2015 Cabernet Franc was quite impressive as well, immediately reminding me of high quality Right-Bank Bordeaux. The 2013 vintage was rated #2 for Best Wine on Bulgaria by Di Vino Magazine (Bulgaria’s most respected wine publication). Along with wine tasting, the estate offers a guest house, horseback riding and hiking. This winery is an model choice for international tourists. Planted in 2001, Tsarev Brod primarily sold their grapes to other wineries until their first vintage, 2015. In the 1970s and 1980s, their 27 hectares were part of a cooperative, but there were far fewer vines as the Russian tractors were double the size that they are today. 15 of the 27 hectares were completely replanted, and the owners, Ivan and Svetla Ivanov remained patient while the vines aged to reach their full potential. At 250 feet above sea level, the only reds they're producing are Pinot Noir and Evmolpia (a crossing between Merlot and the local Mavrud). Cool climate white grapes do best here, like Riesling, Sauvignon Blanc, Chardonnay, and Gergana, (a hybrid between Muscat Otonel and Dimyat). The acidity in the Sauvignon Blanc was arguably the highest among Bulgaria’s wineries at 9.5%. They did a partial malolactic fermentation to mute that down to 7.5%, which is normal for most vintages. Winemaker, Nikolai Krastev keeps his facility extremely organized. All of the tanks he uses are identical sets of two, ranging in size so they’re always completely full without oxygen. He’s also partial to neutral oak, and just 10% of their barrels in the winery were new. In fact, most of his Pinot Noir is unoaked. The tasting consisted of high acid whites, a crisp rosé, a few reds from Pinot Noir, and a Riesling Pet Nat. 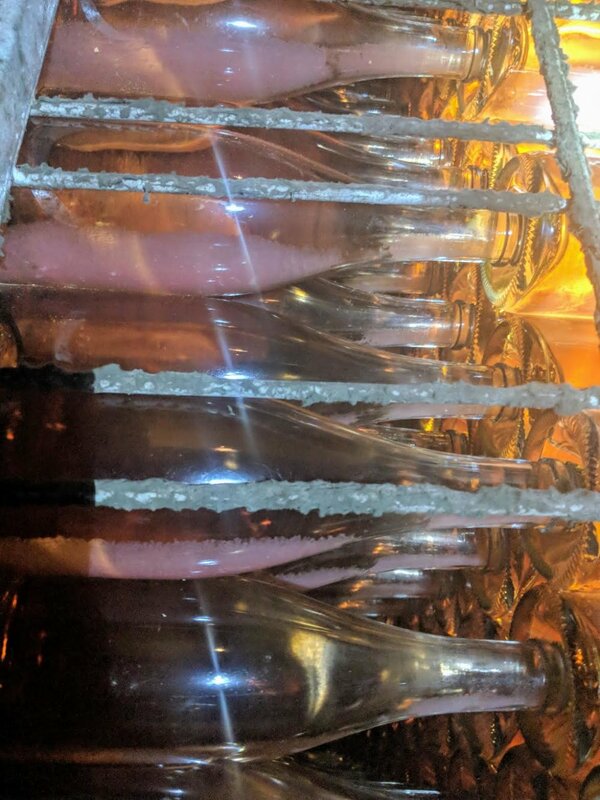 The Pet Nat was bottled at 35 grams of sugar and very much enjoyed by all. My notes on this one included lemon rind, white flowers and slate, coming in at just 11.5% alcohol. My personal favorite, however was the Gergana with tart pears, fresh hydrangeas and flinty minerality. The Pinot Noirs we tasted had a bit more black fruit than red, which was unexpected. 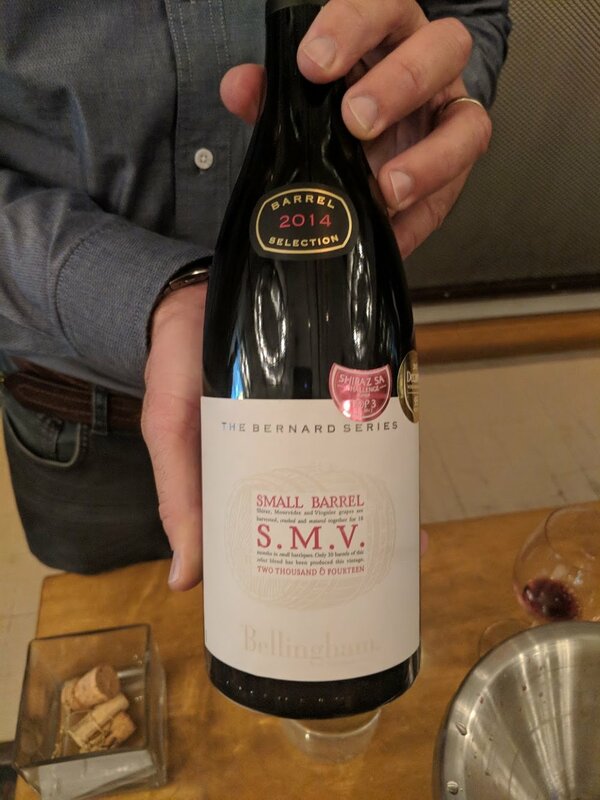 As for the Pinot Noir the 2015 vintage was my favorite, with lavender, pine, fresh raspberries and cocoa, as this one had approximately 10% new oak. In the continental climate of Northern Bulgaria, Chateau Burgozone is located along the Danube River, overlooking Romania. Between 150 and 180 meters above sea level, the estate is situated in a moderate micro-climate, with four distinct seasons. The nights are a bit cooler here, as the region is influenced by the Danube river, but the sunny days balance the climate perfectly. Soil specialist, Dr. Penkoff described this as one of the two best regions for wine production in Bulgaria. This region was always popular for grape growing, as the cities were much more populated then. The Danube River was a highly commercial route, full of boats. Today, you might see one or two every afternoon. When Burgozone purchased the property in 2001, it took almost 5 years to rip out everything. The vines were wild and crazy, offering very little in terms of fruit. Co-owner and Executive Director, Biliana Marinova described the selection process when her family was preparing to plant the vines. The estate received clones from Burgundy and started from scratch, figuring out which varietal does best in their newly purchased soil. Based on the terroir, international varietals Sauvignon Blanc, Chardonnay, Pinot Noir and Cabernet Franc were among the most planted. The local Tamianka and Gamza were planted 2 years ago and this year will be the first harvest for both varietals. The estate produces approximately 250,000 bottles per year. Biliana explained that the vines were very happy, producing tons of fruit after 25 years of the soil being covered in vegetation. Today, the average age of the vines are 10 years old, and the estate produces approximately 250,000 bottles per year. The tasting at Chateau Bugozone was designed with food pairing in mind, to showcase the versatility of their wines. We started by tasting a very refreshing and unique 2017 Viognier with a hint of honey and roses across the palate. This was very French in style, remaining slightly restrained and elegant. The estate has two labels, Cote du Danube (selection) and Via Istrum (premium). The difference is the sur-lie aging, one month for Cote du Danube and three months for Via Istrum. The 2017 Via Istrum Chardonnay is unoaked, slightly nutty, with golden pears on the nose and paired perfectly with foie gras. Interestingly, Bulgaria is one of the largest producers of this delicacy. Both Pinot Noir and Cabernet are made for the Cote du Danube and Via Istrum labels. There is also a Cabernet Franc made for the Via Istrum label, which was my favorite red. My notes for this one included bay leaf, blueberry and bell pepper seeds, also quite French in style. Now the question arises on when we’ll get to see more Bulgarian wine in the USA. With Bulgaria’s progression toward natural and organically produced wine, as well as their shift toward high quality, the possibilities are literally endless. At a jaw-dropping value, Bulgaria is currently exporting to several US states, including New York. I highly suggest reaching out to the importers in your area and tasting the wines I mentioned. Better yet, take a trip to these magnificent regions, explore ancient cities like Sofia and Plovdiv. Don’t forget to try the foie gras as you sample the many styles of Bulgarian wine. It was an honor to experience the incredible and informative Signature Sonoma Valley events this year. From tasting 4 different Zins from the 130 year old Bedrock vineyard to a Hanzell retrospective that included Pinot Noir and Chardonnay dating back to 1977, I was fortunate to be a part of this unique and memorable weekend. With deep history and varying styles, I truly believe there's a Sonoma wine for everyone. This historic hotel has been fully renovated, and become widely known for the spa. While we were busy tasting and touring vineyards, I was able to experience a lot of what The Fairmont had to offer. First, the magnificent bar, 38 Degrees. This chic lounge had around 50 wines by the glass, from local Chardonnay to international Amarone and Rioja. Of course, you could always opt for a 6 oz glass of Screaming Eagle if you don't mind shelling out at around $800. My favorite feature at the hotel was the daily tastings they have at 4:30pm, led by a different winery in Sonoma. I had the chance to taste 5 wines from Roche on Thursday and 4 from Whitehall Lane on Saturday while chatting with the winemakers. The hotel's restaurant, Santé had a huge breakfast menu that made ordering super difficult, in the bright and chic space. The popularity of this restaurant was evident all weekend, especially for dinner. The large pool with cabanas and a calming fountain was the best place to relax after a long day of tasting. Arriving a bit late in the day, we arrived at Pangloss Cellars in downtown Sonoma for a seated tasting. Their selection ranged from Chenin Blanc and Chardonnay to single-vineyard Pinot Noir and seriously smooth Zinfandel. 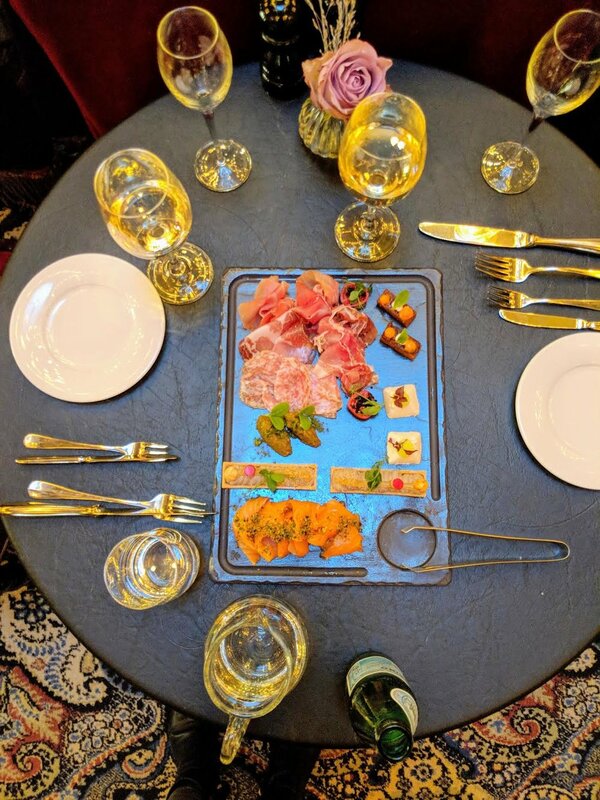 Each of the flights were selected to go with the chef's cheese selection, charcuterie plate, or canapé assortment. 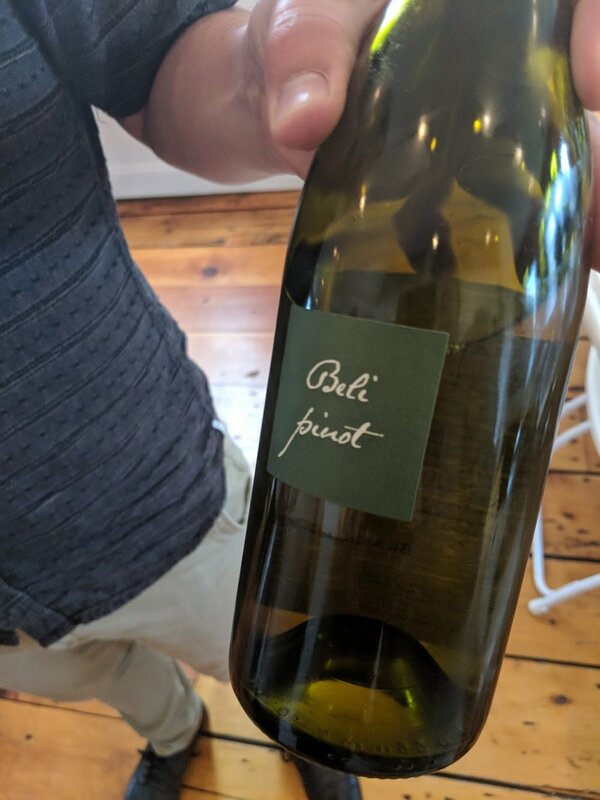 One of the most impressive wines for me was the 2014 Pinot Noir, Charles Vineyard which had a perfect balance of red fruit, fresh herbs and a hint of earth-driven wet soil. The newly renovated Tasting Lounge was magnificent, with two private rooms, perfect for intimate tastings and gatherings. The bar area was welcoming and comfortable, with unique plants, vintage-inspired furnishings, and soft candle lighting. 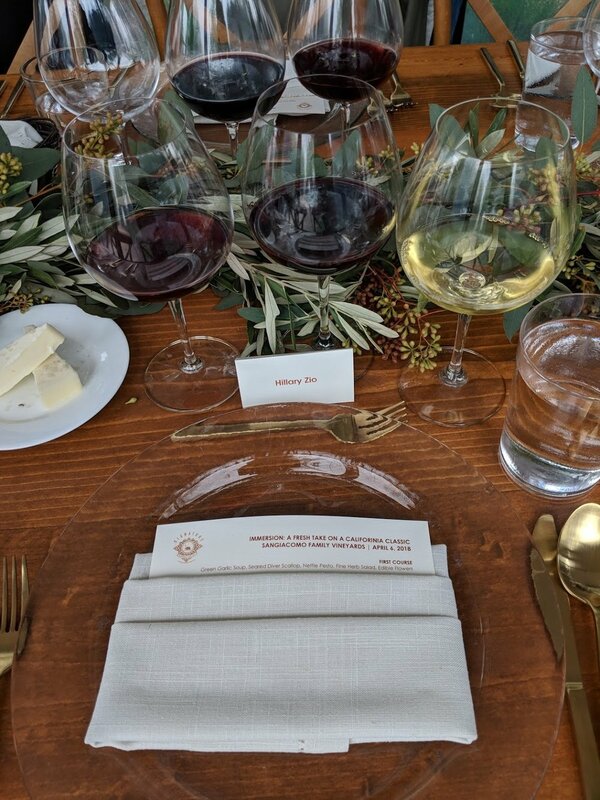 Bright and early, we ventured over to Sangiacomo Vineyards for a moderated tasting and lunch. The Sangiacomo brothers have been managing their family's vineyards for decades, selling grapes to Sonoma's best. 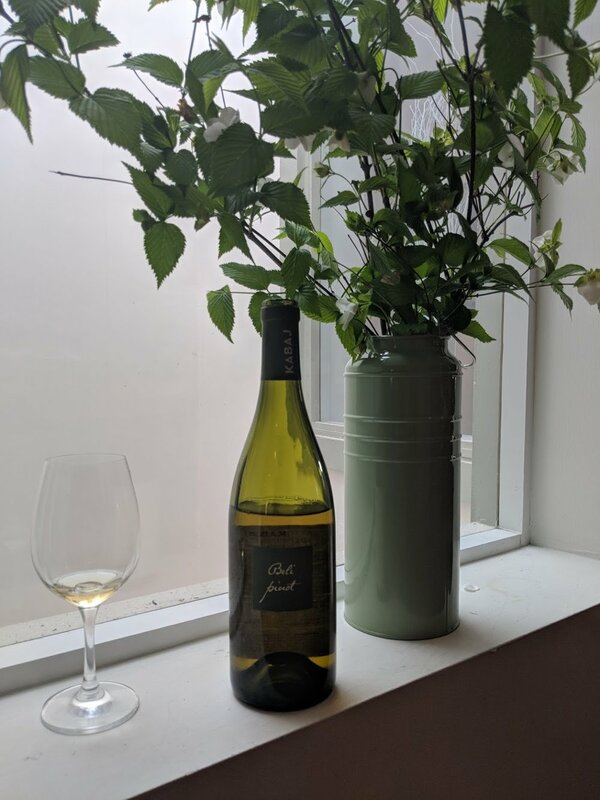 Here, we were able to taste 3 producer's (Auteur, Landmark and Ram's Gate) own rendition of 2015 Chardonnay, from Sangiacomo's Green Acre Vineyard. While made in several different styles, each were brilliant in this tasting, moderated by Master Sommelier David Yoshida. Lunch by Ramekin was almost as delicious as the wines, with a Green Garlic Soup and Seared Diver Scallop and an Herb Crusted Lamb Ribeye with a Fava Bean Puree and Spring Vegetables. Then, we hopped over to the Renaissance Hotel for Immersion: The Birthplace of CA Wine Seminar. A few of the standout wines for me included: Ordaz Family Wines, Buena Vista Winery, St Francis Winery, and Kenwood Vineyards. 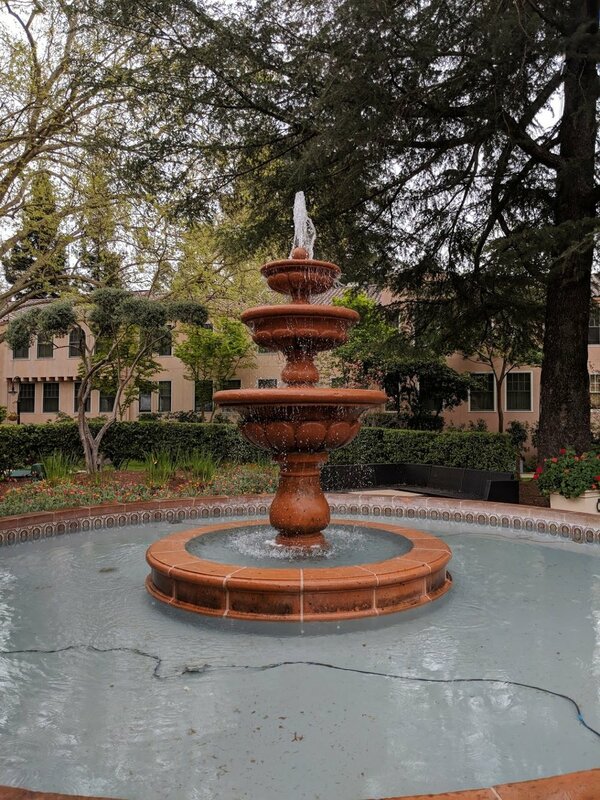 Kenwood brought their 2013 Cabernet from Jack London Vineyard, which had a slightly licorice, cola, and musk on the nose, finishing quite floral. This was probably my favorite, but the 2014 Ordaz Zinfandel from Montecillo Vineyard came in right behind. This one had green bell peppers and pitted cherries on the nose with a hint of coconut on the finish. Around 4:30 we left for dinner and a walk-around tasting at Ram's Gate Winery. To say that this winery is stunning is a complete understatement. Open and airy with a massive entrance and hugely tall ceilings make walking inside an experience in itself. 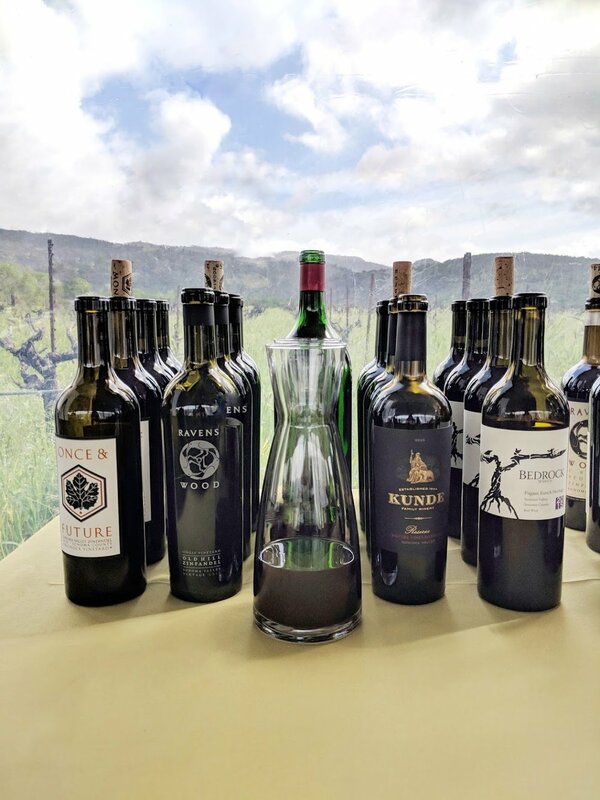 Some of the most memorable wines tasted during the walk-around were: Jacuzzi's 2014 Bordeaux Blend, with a clear nod to the old world and a hint of wet soil and clay-like texture, GlenLyon's 2015 Estate Syrah with ripe plums, vanilla bean and a hint of sage on the nose, and Belden Barns' Gruner Veltliner, which tasted like a ripe grapefruit with hints of pine and broccoli. The day started with a vineyard walk, led by founding vintner of Ravenswood winery, Joel Peterson. We were thoroughly amazed by the 120+ year old Bedrock Vineyard. Before Joel purchased the vineyard in the 60s, the previous owner was prepared to rip everything up and plant Cabernet Sauvignon. Today, he and his staff (including son Morgan-Twain Peterson, a Master of Wine), have discovered dozens of unique varietals on the property. Some of these include Mondeuse, Peloursin, Serine, Grand Noir de la Calmette and Negrette. 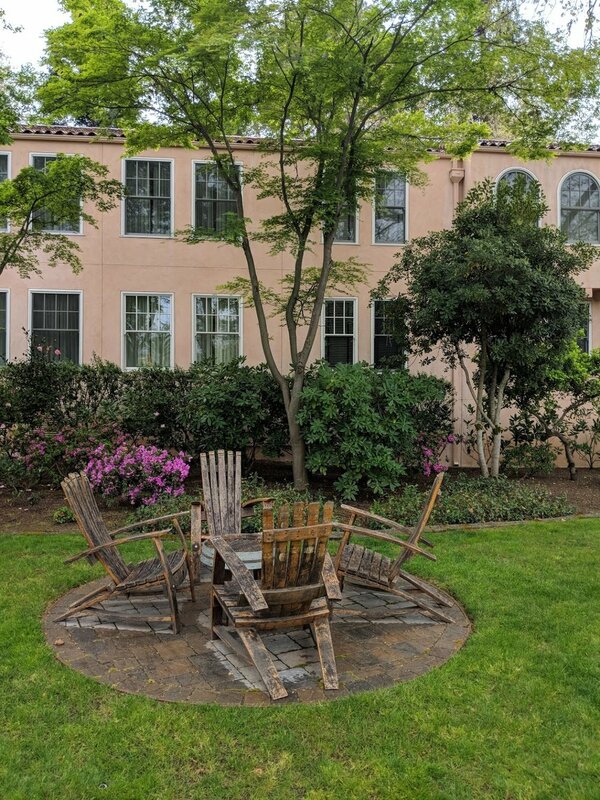 This is now one of the most historically and qualitatively gilded plots in Sonoma Valley. The tasting followed, with an impressive panel that included Will Bucklin, Diane Kenworthy, Joel Peterson, and Moderator Dr. Liz Thach, MW. We started by tasting Joel's new label, Once and Future. This 2016 Zinfandel was fresh and complex, and entirely sourced at Bedrock Vineyard. Next was a side-by-side tasting of 2015 and 1993 Ravenswood Zin from Old Hill Ranch. Joel described the vintages as quite similar, and it was clear the the 2015 will likely turn into the 1993 over time. They were both slightly earth-driven, with notes of dried salami and raspberries. The 4th wine was from Kunde Family Winery, 2015 Zinfandel sourced from Bedrock. This wine had a bit more vanilla and hints of coconut, as they're using around 10% of American oak. Joel described not using it himself, as he found it left a dill characteristic, which wasn't ideal for his style of Zinfandel. To each their own. Next stop: A retrospective tasting at Hanzell Vineyards with President Jason Jardine and Winemaker Michael Mcneil. moderated by Master Sommelier Robert Bath. This impressive tasting was half Chardonnay and half Pinot Noir, dating back to 1977! We were encouraged to taste old to new, Chardonnay, then Pinot, so it looked like the below (with my notes in parenthesis). Above being one of the most memorable tastings of my life, I was also able to figure a few thing out about my palate as well. I usually put a circled star next to my favorites at the end of any tasting. That's AFTER I've tasted everything, I'll re-taste those with a "star," and turn it into a circled star. I know, sounds pretty neurotic.. I "circle starred" the 2002 Chardonnay, 2002 Pinot Noir and 1996 Pinot Noir. You might consider it odd that my favorite wine tasted like "wax, blood and marijuana" and it obviously had so much more in terms of fruit and floral notes, but the complexity was outstanding. In general, I was drawn to the 15-ish year old wines, and thought they were drinking perfectly. The Winemaker, Michael Mcneil has a totally different preference, with the very old and very young being his favorite. Some of the other participants thought that my favorite wines were rather difficult to understand, with the most muted flavors. As a New Yorker who probably drinks more Old World wine, this actually makes sense to me. Dinner followed, at Don and Nancy Sebastiani's private residence. The grandest staircase, Italian-esque fountains and pool set the stag for Chef Ari Weiswasser's 5 course dinner. The Glen Ellen Star crew began with a Marin French Triple Cream Tart, which tasted like the best cheese quiche I've ever had. The Morel Conserva and Shaved Radish, followed and paired perfectly with the 2016 Sojourn Pinot Noir floating around. Next, was the Pacific Halibut Over Fava Puree, too many great Chardonnay's for this one to choose. The Sonoma Mountain Beef New York Strip and Potato-cauliflower Puree followed, pairing best with Arrowood's 1997 Cabernet. The cheese course included Valley Ford Estero Gold and Nicasio Valley Locarno, followed by a very impressive dessert bar. Some sweets at the table included Meyer-lemon Riesling Tartlettes, and a Chocolate Coup with Coffee-molasses Ganache. What an evening! 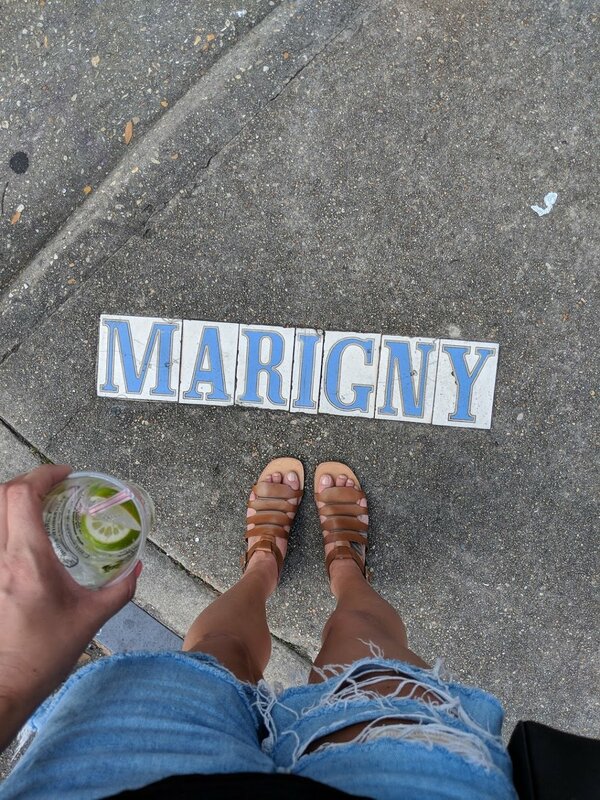 As a first timer, I was completely blown away by New Orleans. If you followed me on IG, you already know that I basically ate my way through the neighborhoods.. While spirits tend to be the focus, I found a plethora of wine shops, bars, and amazing lists throughout the city. The food was spectacular and I'm thankful I was able to consume 5 days of meals in this magical city. Read on.. 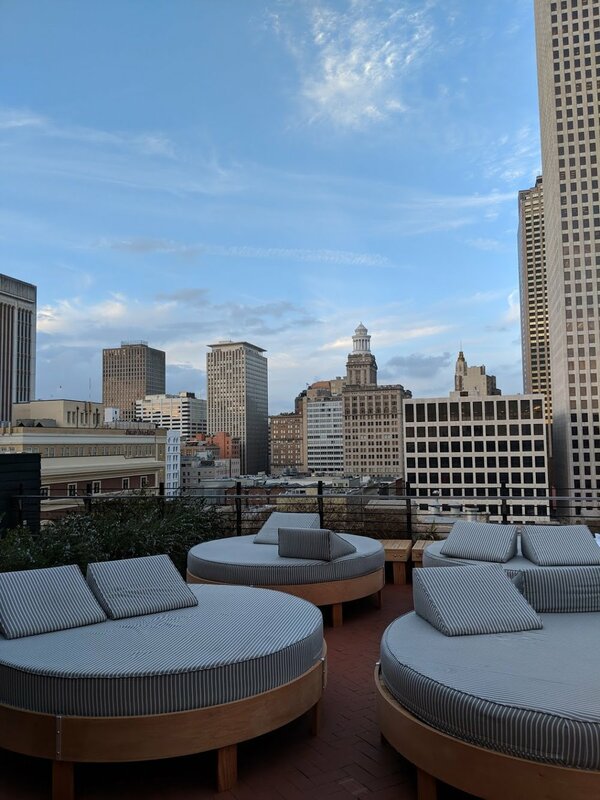 The Ace Hotel New Orleans was perfect for my sister and I. Whether we were rooftop-poolside chillin or downstairs listening to live reggae in the intimate lobby venue, our stay was simply amazing. The rooms are spacious, comfortable, and offer a super cool vibe. With a cocktail shaker in the room, (accompanied by a mixing guide), a sweet sound system and an extra-large bath, it's clear this place caters to a fun, young-ish crowd. Great staff, food, drinks, and restaurants, I literally have zero complaints. Come to think of it, I can't complain about any of the 4 Ace Hotels I've had the pleasure of staying at. Killing the game, guys. There's so much great food in New Orleans, it's easy to feel a little overwhelmed. I'm so lucky that a few of my friends sent me recommendations and I didn't steer far from their lists. Here are my personal favorites, most out of the French Quarter. Bacchanal (wine shop/bar) Located a bit out, in an area I'd consider the Brooklyn of NOLA, this combo joint is perfect for any wine lover. Buy a bottle, drink it on the patio while you order up some snacks and listen to live music, OR take a few to go. I did both. Tableau is an upscale joint with phenomenal seafood gumbo and a creative take on a French 75. Peche Seafood was the perfect spot to split a whole fish with 2 others. Very cool vibes. Willa Jean for a mimosa filled brunch, in this bright, large space that's also great for to-go, fresh juices and coffee. I had the avocado toast and salmon tartine, both were great. Toups Meatery is a meat-lovers dream. We enjoyed a fantastic elk, duck, chicken liver mousse, by this seriously talented chef in a quiet part of town. Compere Lapin is located inside the lovely No 77 hotel. This dreamy Caribbean spot is known for their curried goat and jerk fish. Both were great, along with the ambiance and cocktails. 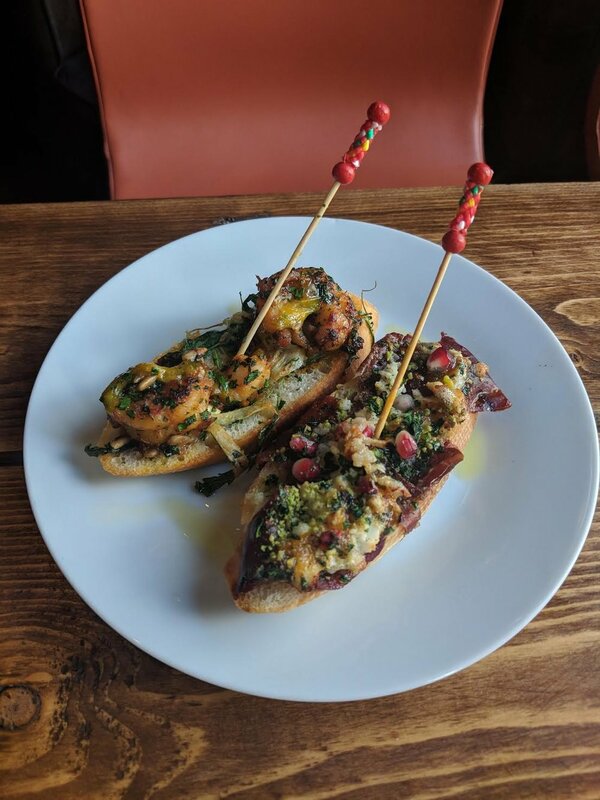 Lula restaurant and distillery is the laid-back spot for American-eque plates in a very fun part of town, just across from the Casino if you're feelin lucky.. I thought I was. Shaya is a fantastic lunch/brunch spot with Israeli fare like lamb ragout hummus and chicken schnitzel. This place is family friendly and majorly award winning, rightfully so. Bayou Wine Garden was the perfect place to spend a Sunday Funday. The international wine and cheese selection was most impressive. The Crawfish guy pulled up around noon and the line was around the block until we left at 4pm. It's also connected to the Bayou Beer Garden, so there's literally something for everyone. Venture out for this one, you won't be disappointed. Every winter, my husband and I venture down to our favorite, historic town of the South. You simply cannot have a bad time in Savannah. The food, drink, hospitality and architecture is bound to leave a smile on your face. After sampling the newly opened spots over the first few days, I hopped back over to my staples toward the end of our stay. Among them all, my favorites for lunch and dinner below. 1.) Little Duck Diner: A design-lover's dreamy, 50's-inspired brunchery. The options are practically countless, but duck is usually the main ingredient. From duck tacos to duck egg rolls and duck quesadillas to duck grilled cheese, you can't help but dig their theme, with a splash of high acid white of course. 2.) Collins Quarter: The hip, Brunch and Mimosa drop in. Always packed, very reliable, the perfect place to cure your hangover. 3.) Debi’s Fried Chicken: the no- frills, cafeteria-meets-diner with all the fixin’s. The locals like to keep this one a secret, but if you’ve seen the movie Forrest Gump, this is the diner where Jenny worked. Huge portions, super cheap, why am I telling you about it, again? 4.) The Gryphon: For high tea and sandwiches in this historic building now owned by SCAD. The décor and hospitality just makes you feel fancy, while the prices remain reasonable. 1.) The Atlantic: The newly opened, nautical cool kid off the beaten path. 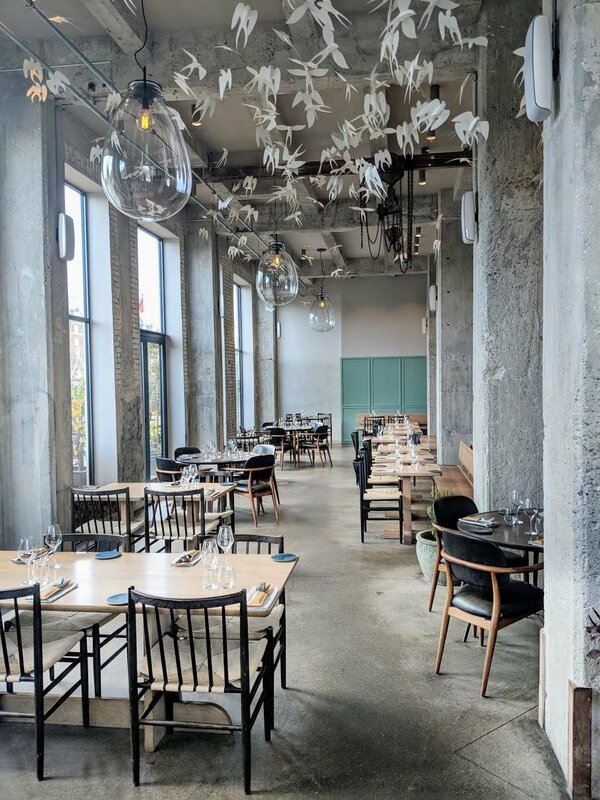 Expect an inventive, American-fusion, shared-plate experience and about 20 wines-by-the-Coravin in this bright and chic spot. 2.) Hitch: 3rd location, top quality service with a creative menu. The rice waffle (Gluten free!) is served with house cured-ham and is an absolute must! 3.) Olde Pink House: One of the city's oldest gems, featuring 3 floors (plus a basement "cellar room") of dining space. Expect hearty Southern dishes, with a twist. We simply cannot skip the whole fish, no matter what it is. Fresh food, friendly staff, in the dreamiest pink mansion. In Vino Veritas: While Savannah’s libations clearly revolve around beer and traditional cocktails, this wine bar is perfect for your vino craving. With 24 wines on tap, flights are encouraged, and the selection is equally New and Old World. Circa 1875: This French restaurant and neighboring cocktail bar makes you feel as if you've stepped back in time. Traditional Parisian cocktails with a France-heavy wine list, we ventured over here for pre-dinner drinks more than once. Alley Cat: This underground, 25 and up speakeasy-style watering hole has one of the largest cocktail menus I've ever seen. Get this, it's printed on newspaper, with articles on Prohibition, Hunter Thompson, and how their drinks got their names back in the day. Artillery: The hippest hipster in town. 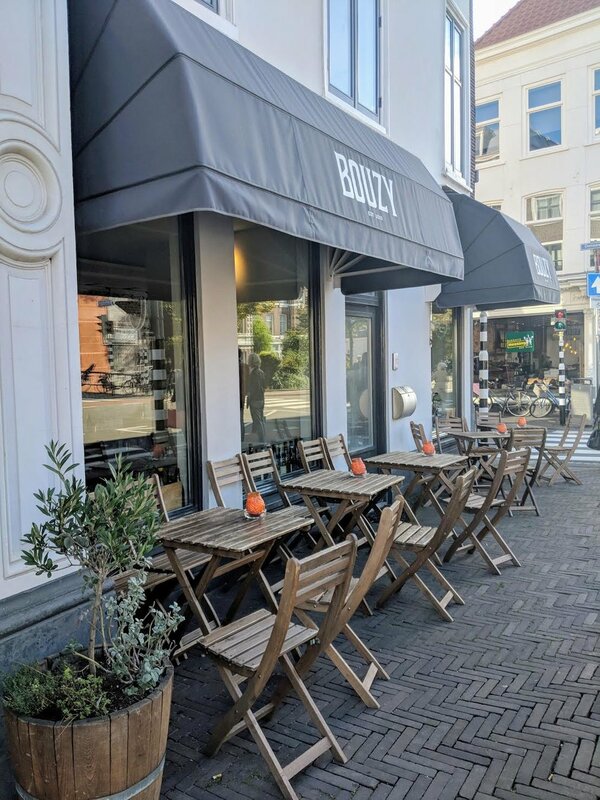 Creative cocktails, beautiful decor and natural wine. Artillery is located where the Georgia Hussars’ armory once housed the cavalry's artillery. Very cool. There’s plenty to do in Savannah, from Ghost Tours to Food Crawls, even a bar on wheels for touring the city’s popular pubs. Ghost Coast Distillery gives a fantastic tour of the facility, as well as an interesting film about the history of making spirits in Savannah. There are several spas in Savannah, but my favorite for a manicure and a facial is Polished Spa. If shopping is more your speed, Broughton street is full of chains and one-offs alike, including my favorite home store to this day, Paris Market and café. Wine lovers cannot miss Le Chai Gallerie du Vin, Savannah’s all old-world shop with unique rarities in their bright, industrial-chic shop. They also have a tasting bar, so you can try before you buy! 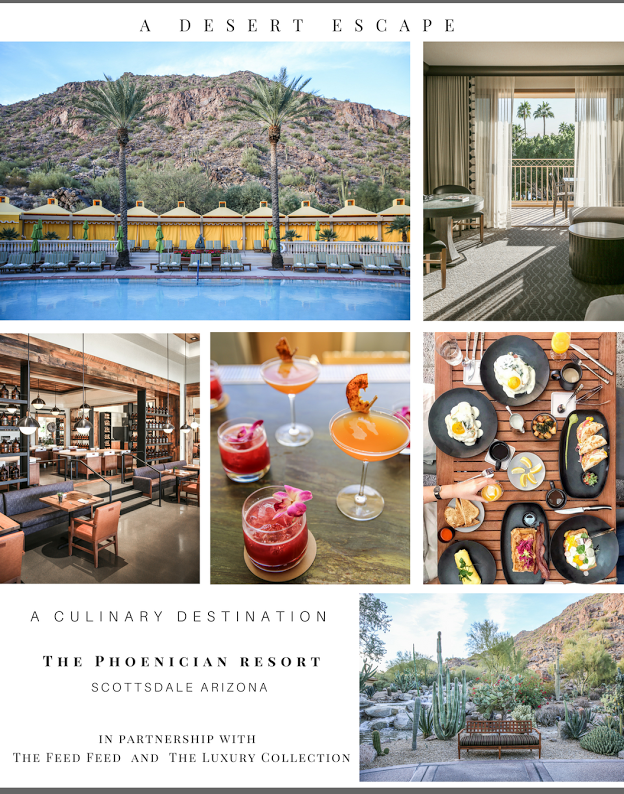 We partnered with The Feed Feed and The Luxury Collection on a weekend excursion, as we toured the newly remodeled Phoenician Resort in Scottsdale Arizona. Between the unique restaurants, massive golf course, luxurious rooms and swimming pools, we would have stayed a whole week if we could. Read on for some of our favorite activities while at the breathtaking property. Flatbread making - One of our favorite activities at the property was making flat-breads at the newly opened, Cotton and Rye. We selected our favorite toppings and popped them in the oven while sampling the restaurants staple appetizers and cocktails. They're also home to one of the best brunches in Scottsdale, with views overlooking the pools. A Hike up Camelback - Is any trip to the Phoenix area complete without a hike? We don't think so, which is why we made sure to wake up early and experience the 360 degree desert views from the top -well, close. The hike entrance was directly behind the resort, just a 10 minute walk! Cocktail Class - After our hike, we were clearly deserving of one of the Phoenician’s famous drinks. The resort took it a step a further and let us learn from the pro behind the bar. Award winning bartender, Robert Porter is in charge of the cocktail program at The Phoenician's upstairs bar, The Thirsty Camel. He showed us how to make a magnificent, red pepper infused mescal drink, as well as a fruity, gin cocktail. The Many Pools - We had to test the water, and it was perfect. Our only struggle was deciding between the waterslide and the relaxing, adults only pool. 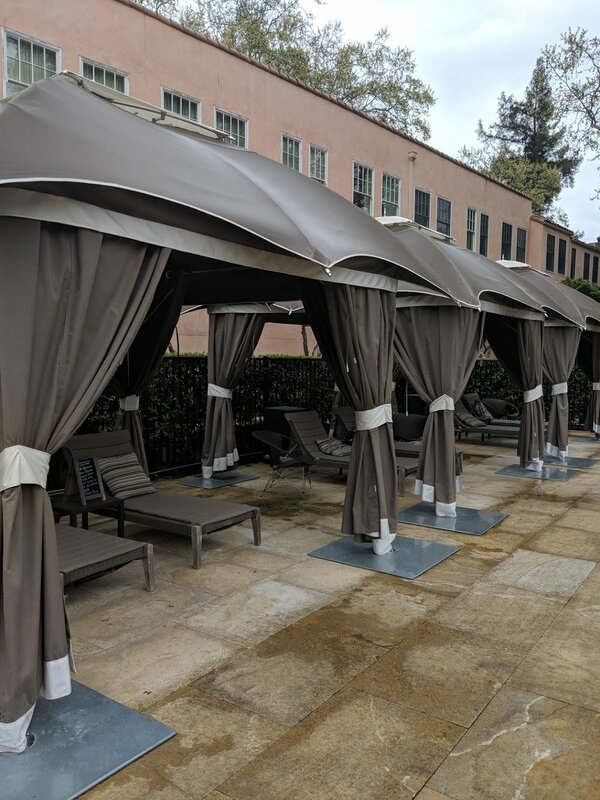 Complete with Cabanas and hot tubs, you can enjoy this luxury in any weather. A room with a view: The property's newly renovated interiors will have you never want to leave your room. With a private patio overlooking the desert landscape, a luxurious marble bath and separate shower, as well as the special perks you won't expect; like Italian linens and turn-down service with culinary treats. How is the youngest generation of wine collectors changing the market? What are they buying and why? The open-mindedness of a young drinker won't come as a surprise, but what does that mean about the future of wine collecting? Read on for my research and a bit of personal experience (on both sides). Say you're a 20 or 30-something with money to spend on enjoying fabulous wine. Due to your life experience, tech savvy nature and neutral mindset, your selections aren't probably going to look much like your father's. For one, you don't really care about what kind of scores a couple of old guys are handing out. You'd rather check out apps like Delectable, where several, unprejudiced wine drinkers are rating the same wine, and you can instantly view more of an overall average. How about brand loyalty? I've found that Millennial drinkers, while likely to remember wine brands (due to technology), are much less likely to purchase the same wine repeatedly (compared to collectors in their 40s and 50s). The younger gen. can easily be sold on a wine they’ve never heard of, as long as it’s generally what they’re looking for in terms of style and price. Does this mean we'll see less Cult Napa Cab and Bordeaux? Big names will always sell, they’re recognizable and trusted. However, there is evidence of heightened curiosity about the wine world's unknown, especially in the last 10 years. I think that a lot of these, strictly cult followers are gonna die out. The young wine collectors will try everything once, but is that gonna be enough for these renowned names to keep profits where they are today? The millennial sale and the baby boomer sale are completely different. While the younger generation rarely orders the same wine twice (even after telling me how much they like it), the older generation doesn't always seem too interested in a new producer, or exploring a lesser-known wine region. It’s as if many of them either don't like/want change or care more about impressing friends and family with big names and “top” vintages. In my experience, young collectors don’t really care about that. They would rather explore wines in every country, to attain knowledge. I’ve found that many young collectors are fascinated with understanding restaurants' wine lists. Who doesn’t want to sound smart at the dinner table? Or know how to make the best decision when the language barrier comes down on your vacation? Statistics prove that millennials love wine, and they're drinking much more of it than older generations. Since they're exploring lesser-known wine regions and producers, the prices won't usually be as high as the sought-after staples. Therefore, you have a lot of young people buying several different types of wine and will probably need more storage than today. I predict that in the next 10 years, more wine shops in America will stock "unheard-of" options, and the purchase by professional scores will be a thing of the past. Cheers to that! Do You Need a Coravin? Essentially, the Coravin (Wine Preservation Opener) allows you to taste wine (or have two glasses) without pulling the cork. 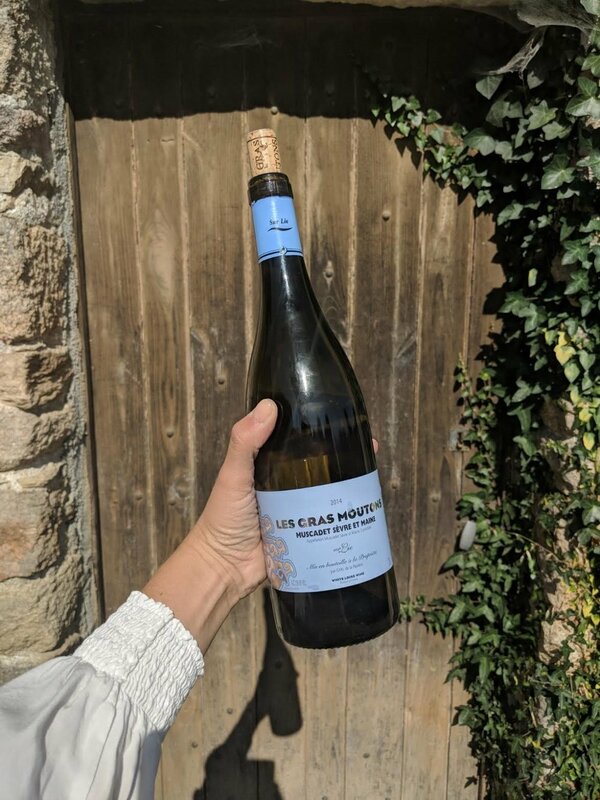 After initial use, you have around 7-10 days to drink the rest of the bottle and can expect the wine to taste practically the same as it did on that first day. No, not everyone needs or will use the Coravin, and the new models are around $350, so not cheap. Mine, however, can be found on the kitchen table when it's not in my purse. Also, I've saved several precious wine dollars since owning the tool. Take this 5 question quiz to decide if the Coravin is right for you too. 1.) Assuming you drink wine most nights, about how much do you drink in one evening? 2 glasses? Consider a Coravin. 4 glasses? Maybe not. If you're a wine lover and your husband's a whiskey lover... consider a Coravin. 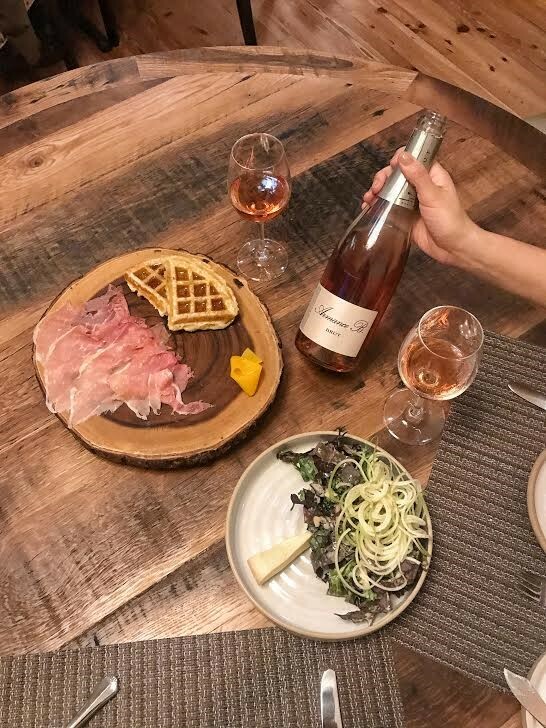 If you and your spouse or roommate can easily finish a bottle with dinner in one evening, still consider a Coravin because it sounds like you two could be serious wine lovers. 2.) What does your cellar look like? Anything good? I'm sure all of your wine is fantastic, but how much of it is age-worthy? Let's say you have a case of 1990 First Growth Bordeaux, and your sources are telling you it's time to drink, but time for whom? Everyone's palates are completely different, and what I consider perfectly aged, you might consider dirty. Perhaps your taste is a bit more fruit-forward. Use your Coravin on one bottle to determine what to do with the rest of a case. Then, spend the next 10 days showing your friends how the wine is aging by pouring them all a 2 oz. tastes. Hey, this stuff's expensive! 3.) Do you work in wine? Restaurants all over the world have found that the only way to put that $100 bottle on their BTG (By the Glass) list is to use a Coravin. I don't know about you, but when I see a $30 or $50 glass, I feel a little fancy.. It also makes me think that the restaurant or bar cares about wine education and the well-being of their staff. Ok, maybe that's a little presumptuous, but it definitely adds to the cool factor. In a wine store, you can easily up-sell by offering your client a 2 oz pour of something great. Again, my feels are strong for a shop offering "tastes" of a $75 bottle, or anything over $20 that is. Distributor? A Coravin is an absolute must. I don't even need to explain this one, but imagine what it can do for reps with a strict sample budget. Also, show your client you care by showing them the good stuff whenever you can. They don't need to know you've poured it for a dozen others that week. 4.) How often do you entertain? By far the best way to check out what the wine you're considering pouring for your guests tastes like. Is it going to work with that lamb chop? Is this good enough for my uncle? Is this bottle in good condition for Saturday night, ie. not corked or too young? 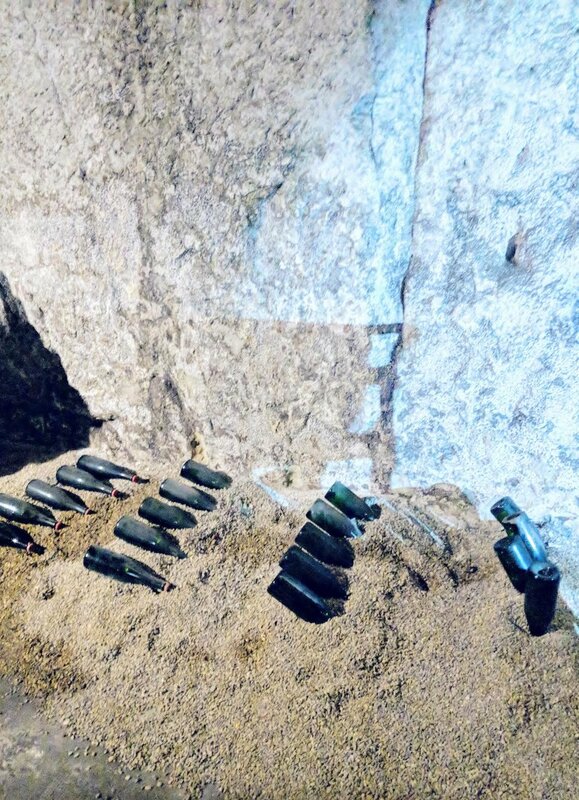 Decide this for yourself by considering the price of the bottles you're opening by corkscrew. Also, calculate the amount of wine that ends up going down the drain.